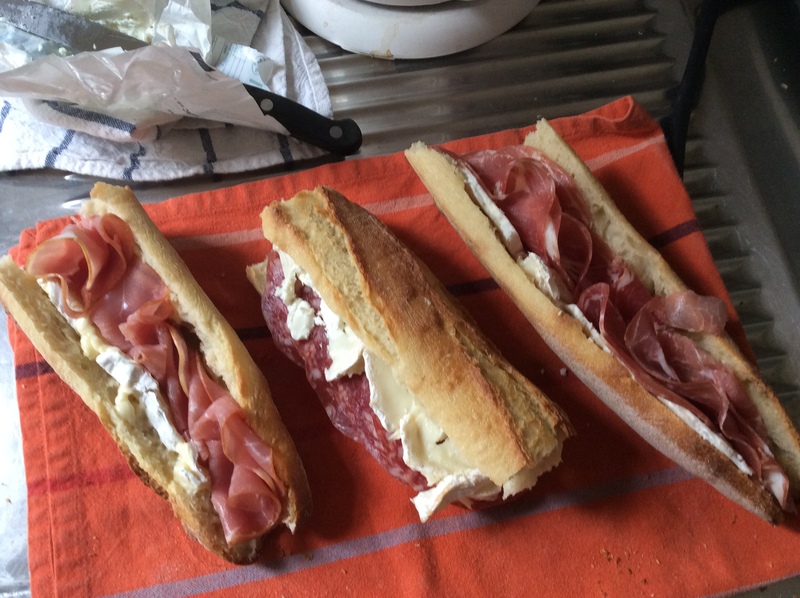 I get a very late start resuming my history of ideas adventure today: I greeted my husband Bryan last night in Saint Quentin en Yvellines as he finished Paris-Brest-Paris in excellent time, 1200 kilometers in 53.15 hours! We celebrate his accomplishment and restore his energy by feasting throughout the morning and early afternoon, after he gets some good rest. When I arrive back in Paris, I still have at least three good hours of daylight, so I throw down my overnight bag and head right back out into the street. Although I only have a short time to explore, it turns out to be a very fruitful evening. Today’s explorations will be conducted in light of some new information I’ve just uncovered. As Bryan slept, I researched, and as I had been discovering new details about the history of the places I visit, the more leads I have. As I enter these new combinations of keywords, I discover this wonderful U.S. State Department paper on the official history of U.S. representatives in France, complete with more detailed location descriptions, including some historical addresses listed alongside the new. It’s the site-identification Rosetta Stone I’ve been looking for, and I discover that three of the places I visited on my second day in Paris have different modern addresses. Today’s mission, then, will be one of rediscovery. 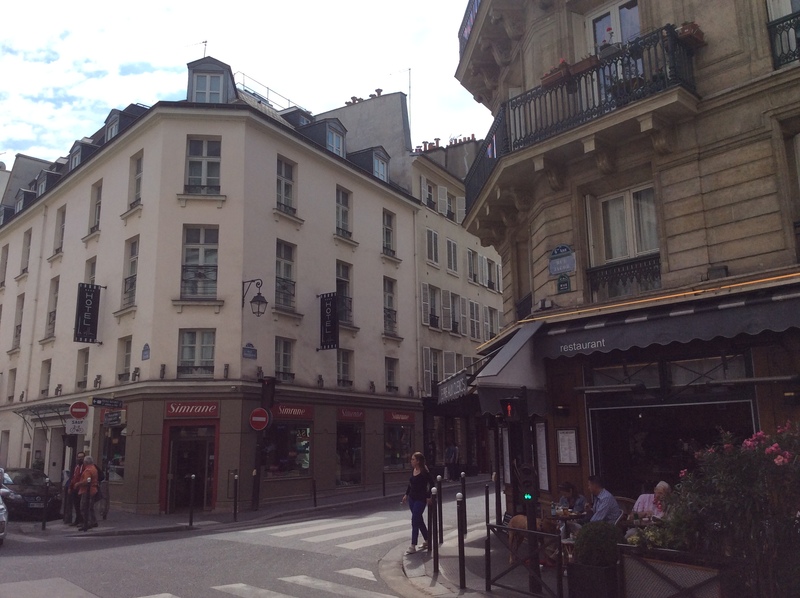 I begin by heading up rue Montmartre over to Boulevard Montmartre, then to rue du Faubourg Saint-Denis, once again in search of the site of the mansion farmhouse Thomas Paine shared with six others from the fall of 1793 to 1794. The State Department paper reveals that while in Paine’s time the address was number 63, it’s now numbered 144, and that the mansion had once belonged to Madame de Pompadour, Louis IV’s official mistress. Unlike the other two sites that I’ll be seeking today, this one is quite far from the original address I sought, because the original rue Saint-Denis of Paine’s time had been lengthened significantly since then. It’s a beautiful and still warm, and Bd. St-Denis, like Bd. Montmartre, is thronged with people greeting friends, walking their dogs, shopping the produce markets, hawking flowers, and eating and drinking at the cafes, with a few drinking in the street and getting a little rowdy. As I mentioned in my earlier post about this street, it reminds me of the old Mission district in San Francisco, and I love it. The crowd is multiracial, multicultural, rich, poor, and in-between. 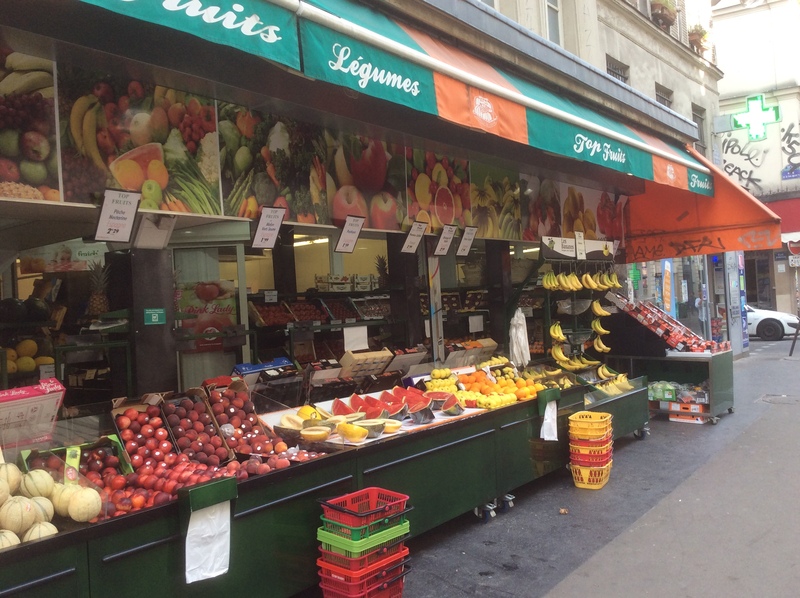 There are cafes and little food markets offering foods from around the world: Indian, Pakistani, Bangladeshi, and Turkish, to name a few, and the large produce markets, open to the street, offer a colorful array of fruits and vegetables. As I head farther north and uphill, pretty far past 63 that I visited last time, the neighborhood becomes fancier, the buildings are taller, larger, more ornate, and well-kept. At 144 rue Faubourg Saint-Denis, I find an imposing brick building, beautifully ornamented, but closed off with iron gates. I photograph the outside, then peer into the large courtyard. A young man, clearly a local, stops and asks if I need directions, then explains that people can usually get into the courtyard of this building if they need to, and we chat a bit. Then an elderly man, who’s taking keys from his bag approaches the side gate, overhears our conversation and offers to let me inside as long as I make sure to close the gate behind me. I agree, and briefly explain my mission: he’s surprised at the historical details of the place formerly at this site. He smiles at my obvious enjoyment of the beauty I’m pleased to find all around me here, and explains that the lush green wall garden towering over us to our right is the largest in all of Europe. He’s a humble man and won’t consent to have his picture taken or name listed for this piece. I thank him, and he wishes me a good evening. 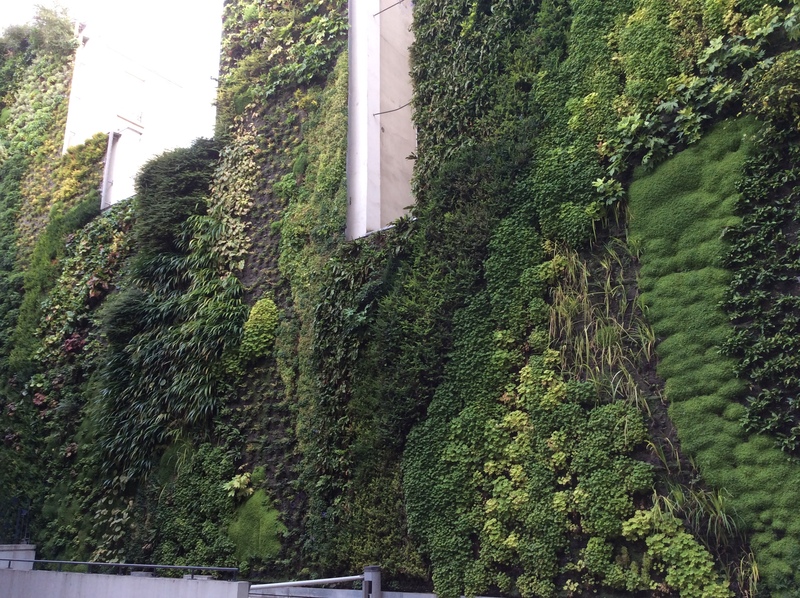 Though Paine might be pained to find that his happy garden retreat is now built over with towering (though very handsome) apartments and SNCF offices, he may take some comfort at the spectacular green wall. 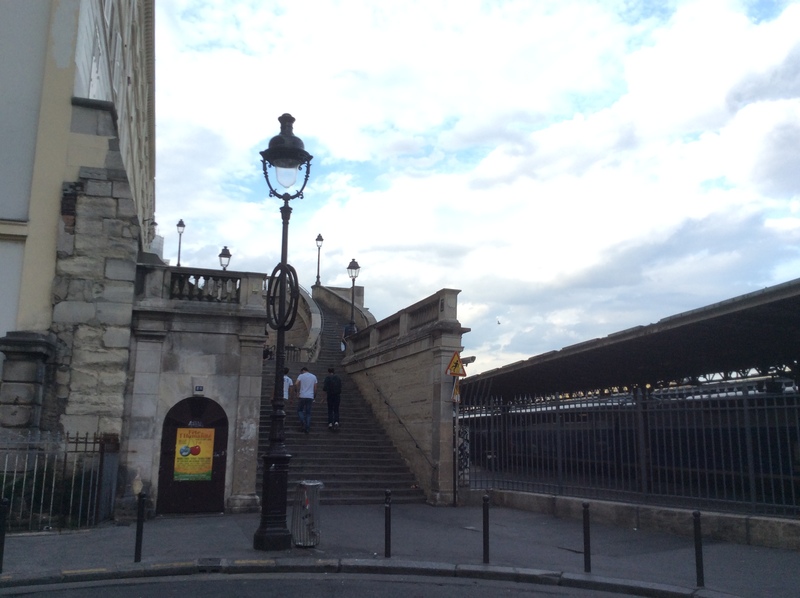 I exit the back gate of the courtyard and find myself at the side entrance of the Gare du Nord. I go up an inviting stairway that takes me to the street above station level, though it’s not necessarily the most direct route, just ’cause, ya know? In a place such as this, sometimes you just have to meander a bit. After a bit, I pick up the pace, since I lingered at the last place and it’s getting late. I head in the direction of the square at Republique, back to the friends’ house that Mary Wollstonecraft lived in when she first moved to Paris in December of 1792. 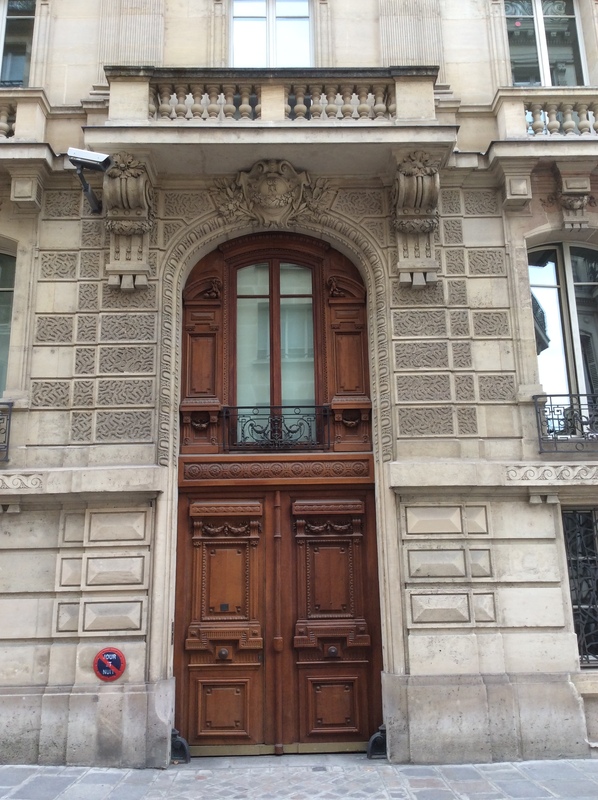 There are two candidates for the site of the Filliettaz house: the first is at 22 rue Meslay, the number I found in all the biographies I referenced, which may reference only the address at the time. Or, it could be somewhere farther up nearer to the house the author George Sand was born in, number 15 at the time of her birth in 1804, which is, of course, is close to 22. A couple is strolling down the street, an older man in theatrical round blue glasses and a glowing green cardigan, and a younger tanned man with a leather vest and wavy hair ‘artlessly’ swept back in a ponytail. They catch me looking around and I wish them good evening, and the man in the green cardigan asks me where I’m from. As usual, my poor pronunciation of French gives me away, though he tells me it’s my ‘happy visitor smile’. He tells me what a great street Meslay is and I agree, and he helpfully points me towards George Sand’s house. I tell him the object of my quest, but he hasn’t heard of the Filliettaz house, though is familiar with Mary Wollstonecraft, but doesn’t know she ever lived here. We say good evening and part ways. Though I find the Sand house easily, try as I might, I see no indication of the original Filliataz house andits exact location, just as I couldn’t in my books or online, so I photograph the part of the street and the houses near enough to the Sand house to be number 22. As you can see, it’s really a great street, just as the man said, and it does seem more likely that Wollstonecraft lived in a house near this end of the street, given the story of seeing the King passing by, since it’s higher up and the street veers closer to Boulevard Saint-Martin. 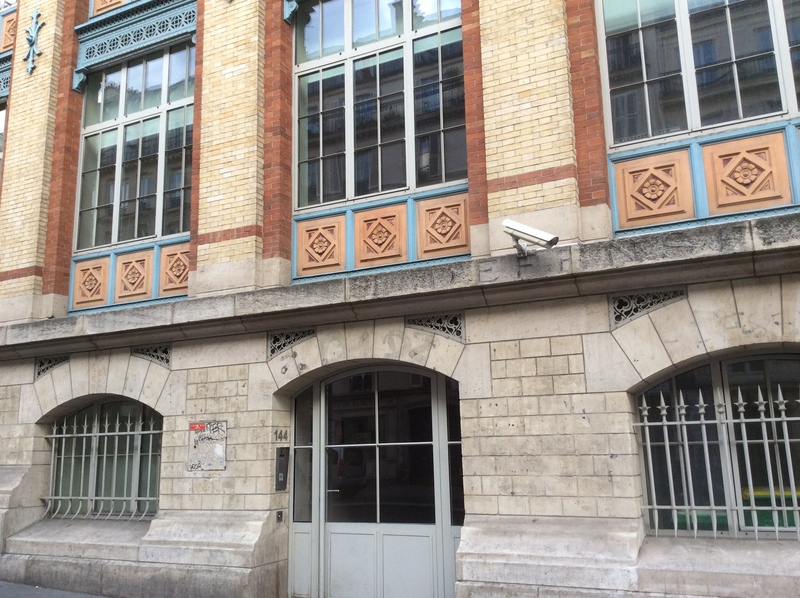 The last stop is 95 rue de Richelieu, which the State Department paper describes as the former 101 rue Richelieu. The name of the house where Thomas Paine lived with James Monroe and his family was the Hôtel Cusset, and I find this name with the address carved into an ornate lintel made of an incredible variegated, colorful stone over the doorway of another grand building just down the street from the current 101 that I visited last week. The address 101, which I found in more than one source, must have been the old address, and if that’s true, this lintel must date after Paine’s and Monroe’s time here. As I described in the tale of my second day in Paris, Paine was physically broken down from his imprisonment in the Luxembourg, and the Monroes, while sympathetic, found him increasingly difficult to put up with over the two years he stayed with them afterwards. This place, now a hotel in the modern sense, is right around the corner from where I’m staying, and the kind lady at the front desk suggested that I return when the day manager’s there who might be able to tell me more about the history of the building. Since it’s growing dark and I’m getting hungry (do you notice that the beautiful stone that surround the doorway look like perfectly marbled charcuterie and veined blue cheese, or is that just my hungry belly making that observation? ), I plan to do that very thing tomorrow. ‘French Revolution. Wikipedia, The Free Encyclopedia. 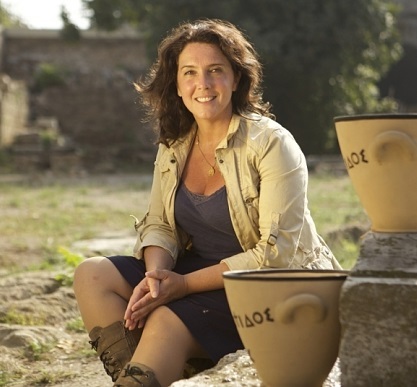 I’ve been listening to this wonderful new series by the always delightful historian and documentarian Bettany Hughes, as she delves into the origins of philosophy. She tells us the story of three ancient thinkers who remain among the world’s most influential: the Buddha, Socrates, and Confucius. These men, who all lived within one hundred years of each other, formulated their groundbreaking philosophies at a time when new technologies in food production, housing, and travel allowed human beings, for the first time, to form sophisticated, specialized societies. This enabled people to spend a lot less time devoted to mere subsistence and to divert much of their energies into the arts, into thought, and into figuring out how the world works. It also made people ready and able to think of life as something they could improve and control, not merely subject to the whims of nature and of capricious, mysterious gods. Hughes is not only enamored with these three great thinkers because they are fascinating in their own right, but because she thinks of philosophy as I do: a deeply practical pursuit, in which we puzzle out how to go about living as good a life as we possibly can, as individuals and as societies. As I’ve heard her say, we need to bring philosophy back to the street where it began, where Buddha, Socrates, and Confucius first confronted the world with their ideas, and where it also belongs. I head towards the Seine, towards the wonderful Saint-Germaine-des-Pres neighborhood and its environs across the river where many sites associated with my subjects are; I’m really looking forward to spending the bulk of my day here. 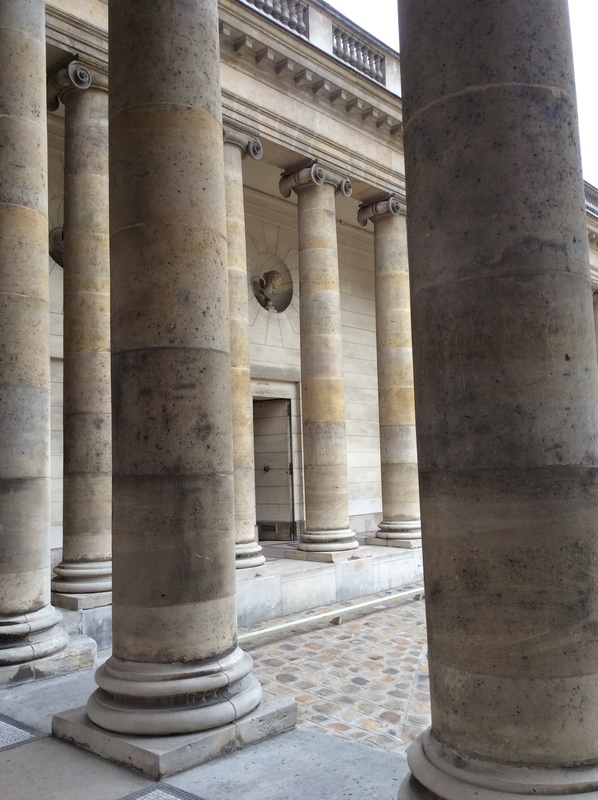 On my way down towards the Seine down the rue de Louvre, I pass by the colonnade of the older part of the Louvre, which Thomas Jefferson admired very much. Jefferson was forward thinking in science and human rights theory, but looked more to the past for his politics, art, and architecture. He thought, up to his time, that the ancients Greeks and Romans had reached the pinnacle of architectural and the artistic achievement up to that point, just as they had done in politics by with their democratic and republican forms of government (though he believed that ancient Germanic tribes were actually the first to govern in the spirit of respect for human rights) and in philosophy with their focus on reason and the development of virtue. 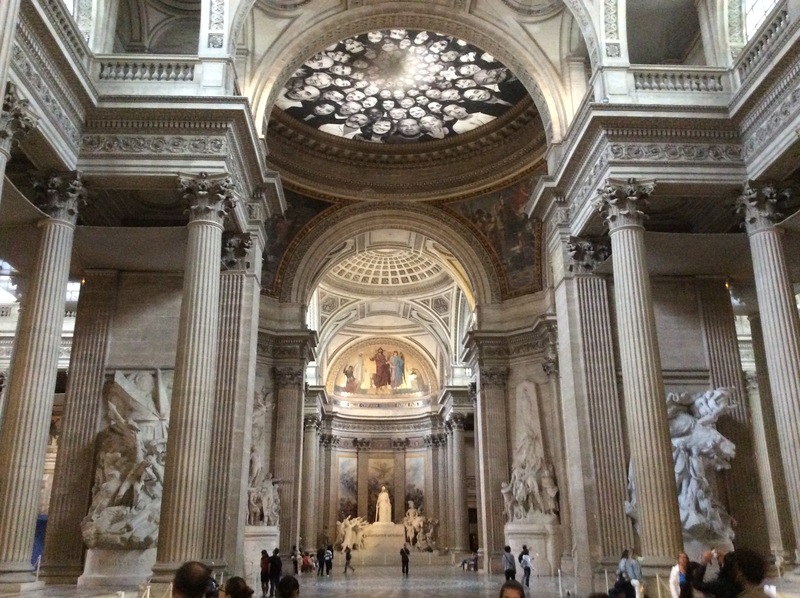 He loved the Greek and Roman-revival art and architecture the most, all the rage in Paris at the time of his visit, and believed it inspired virtuous sentiments in all who beheld its beauty and symmetry. Jefferson spent his five years here drinking it all in, seeking inspiration for great new public buildings for his own country and well as for his own home. Thomas Paine and Thomas Jefferson were both regular guests, along with Adam Smith and Benjamin Franklin, of the famous salon of Sophie de Grouchie and her husband, the great Marquis de Condorcet, at the Hôtel des Monnaies. It’s the French Royal Mint, and Condorcet held the position of Inspecteur general des monnaies (chief currency inspector), so he and his family were given a suite of rooms there, on therue Guénégaud. The Monnaie is a grand building facing the Seine, on quai Conti between rue Guenegaud and the impasse de Conti in the 6th Arrondissement, not far to the east of the Institut de France. 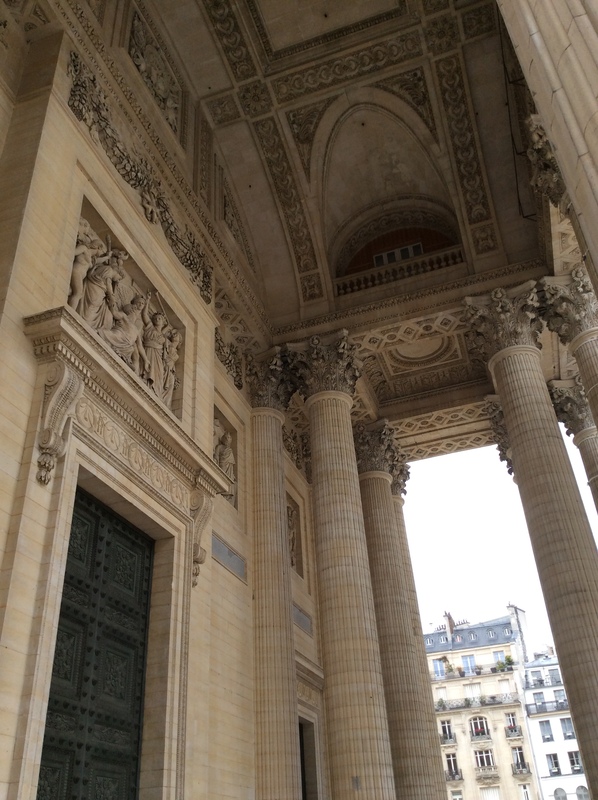 I peeked inside the gate to see one of the grand entryways, but I can’t back up quite enough get a good picture of the front of the building without falling off the wall onto the Seine walkway, so you’ll have to visit the Monnaie website if you’d like to see the entire facade. There’s also a statue of Condorcet just a block away, also on the quai Conti facing the Seine, near the corner of the quai and the impasse de Conti. De Grouchie was an embodiment of the successful Parisian society woman of the 18th century, very fashionable and an accomplished intellectual. She translated Smith’s Theory of Moral Sentiments into French, and her salon was well attended by the best minds in Paris. 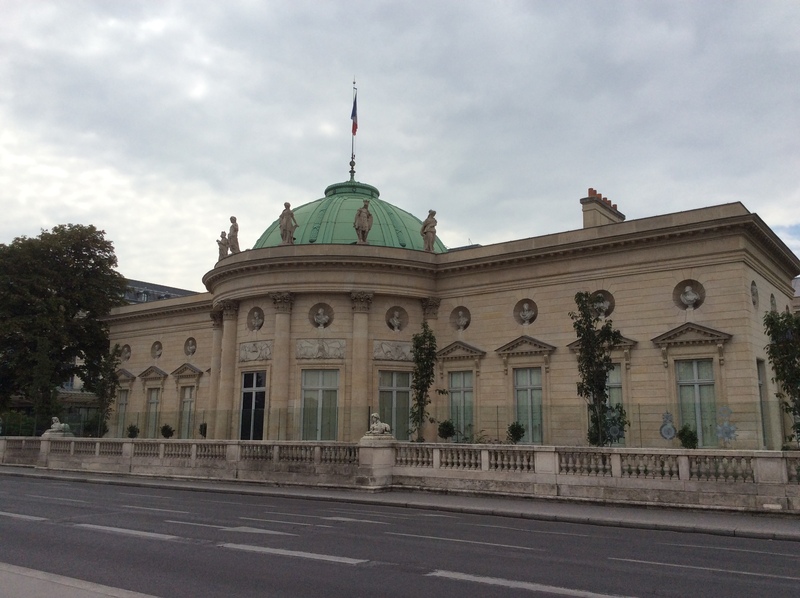 The Marquis de Condorcet was a mathematician, philosopher, and author, and he lived at the Hôtel des Monnaies. He was an ardent supporter of the American Revolution and hoped its influence would lead to similar forms of government to spread throughout Europe as well. He shared the Enlightenment belief, along with Paine, Wollstonecraft, and Jefferson, in the perfectibility of humankind through education and through civic participation in a democratic state founded on human rights, and also believed the inevitable triumph of the human race against government oppression and usurpation of the right of self-rule. Like Paine and unlike Jefferson, Condorcet was unequivocal on the subject of full and equal rights for people of all races, and with, Paine, declared the concept of human rights meaningless if it did not apply to all, so he called for the immediate and full emancipation of all slaves. Like Wollstonecraft, he was what came to be called feminist, though he was more ardent and unequivocal in his belief that women were full intellectual equals with men and should have the exact same political rights. Of course, all of these were among the topics of discussion at the salons, along with the meaning of French Revolution itself and the direction it was going. Condorcet held onto his faith in the ultimate benefit of the Revolution to his country despite the extremist faction that had taken over and plunged it into violence. Since he believed that, once awakened, the people would ultimately triumph in their fight for human rights, he saw the Terror as a temporary setback, a bump in the road to liberty. Condorcet would become one of its most tragic martyrs. He hid out at a friend’s house for eight months, then fled to the woods, after the Robespierre’s Jacobins ordered his arrest in 1793. He was captured when he left the woods three days later, famished, attempting to purchase a meal. He was found in his prison cell two days later, the victim of an apparent suicide. On my way to my next destination, I walk a short way west and turn left down rue Bonaparte, keeping an eye out for a site which two of my sources describe as near this end of this street, but neither give an exact address. 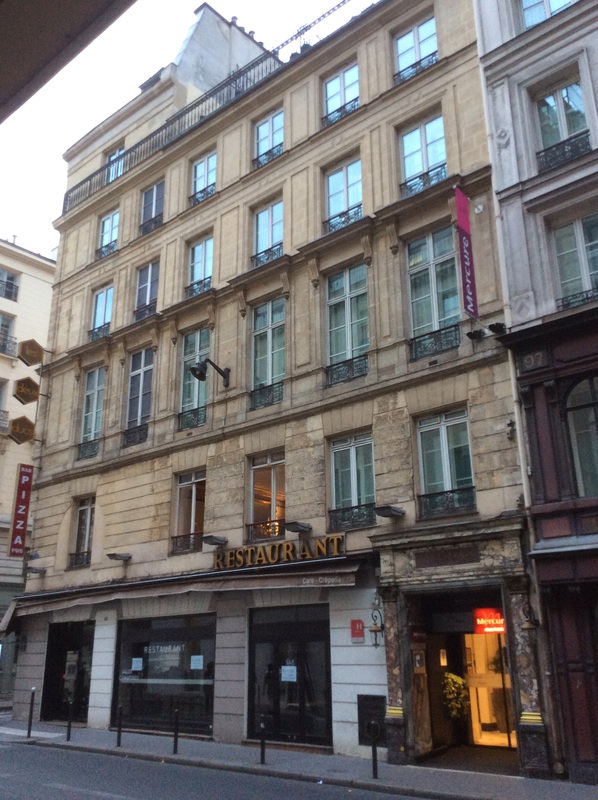 Thomas Jefferson stayed here for a short time in August 1784, when he moved to the more comfortable Hôtel d’Orléans from a smaller one he first stayed at upon arrival in Paris. 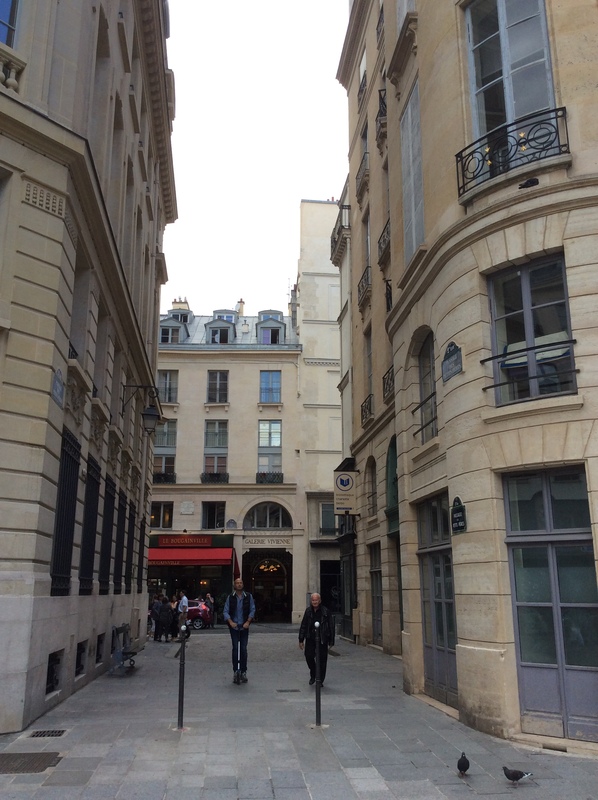 This street, called rue des Petits-Augustins in Jefferson’s time, is also in the 6th Arrondissement. Despite looking carefully, I don’t see a marker identifying the site of the Hôtel. I do see a grand entryway with a historic plaque describing 5 Rue des Petits-Augustins, near the north end of the street, as a former residence of many famous people, especially artists. This is a bustling arts district, crowded with wonderful and elegant little galleries. Anne-Sophie Duval, Galerie de Vos, and Lawrence Esnol Gallery share the ground floor of that Hotel. I consider it a possible candidate for the location I seek, since it’s a grander hotel than the others I see within these two blocks, but since I can’t confirm it, I move on. My next confirmed destination (at least, a specified address, without reference to whether the street numbers ever changed) is a house that Mary Wollstonecraft often visited and later lived at for awhile. In September 1793, she returned from her sojourn in Neilly-sur-Seine to Paris. She had become pregnant with Imlay’s child and moved in with him to Faubourg Saint-Germain, to a house of her close friend Ruth Barlow, wife of Joel Barlow, Paine’s and Jefferson’s friend, statesman, and poet (more on Mr. Barlow shortly). At the time they moved in together here, it was still a happy stage in Wollstonecraft and Imlay’s relationship. Wollstonecraft was described by friends and acquaintances as glowing and never so lovely as at this time, and Imlay was temporarily dazzled enough by his intellectual, unconventionally lovely, and emotionally intense lover to put his womanizing on hold. The small house the Barlows owned here was rue Jacob, number 22. If this address address matches its modern location, it’s near the Musée National Eugene Delacroix in the 6 Arrondissement. Now there’s a jazz club / cabaret and Galerie Eberwein on the ground floor of this place. I continue my trek farther south and a little to the east in this oh-so-charming neighborhood, among my favorites, especially as I’ve gotten a little deeper in and away from the crush of tourists and tacky souvenir shops. I head down rue de l’Odeon, below Boulevard Sainte-Germain. Thomas Paine moved in with printer and writer Nicholas de Bonneville in the spring of 1797, after the Monroes had left Paris, and lived in his place for five years, until 1802. While here, Paine wrote a series of articles for Bonneville’s paper promoting the invasion of Britain by France for the purposes of overthrowing the corrupt monarchical system there. Napoleon Bonaparte visited Paine there, interested in the strategies for doing so that Paine had outlined. At first, they were friends, but Paine became disillusioned with Bonaparte and didn’t end up trusting that his intentions were anything other than self-serving. He moved out of this house and back to the United States in September of 1802, at the invitation and with the help of newly elected President Thomas Jefferson, to the latter’s credit. Paine’s reputation had been seriously undermined in the United State after the publication of The Rights of Man and with his involvement in the French Revolution. I find that the street number to this house has definitely changed with the name. 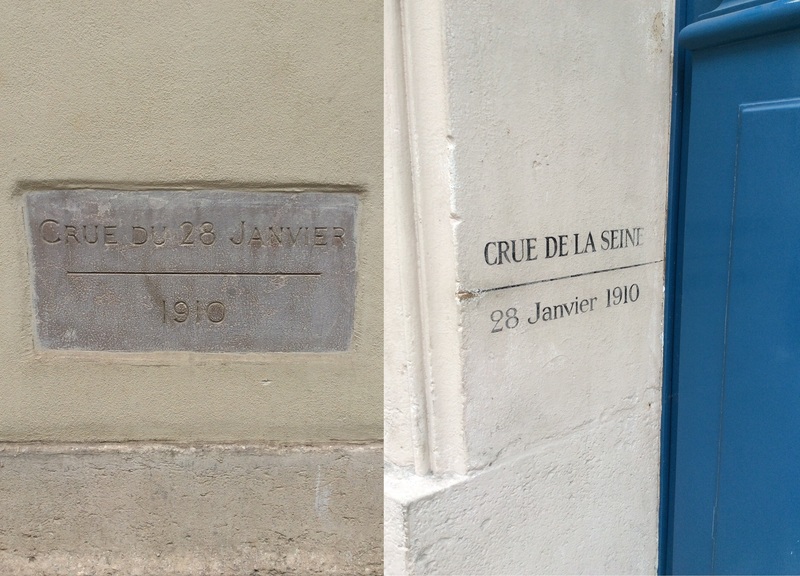 The plaque that identifies the house as the former residence of Paine and Bonneville is at number 10, while the biographies I referenced for this site list 4 rue du Theatre Francais, the former name of rue de l’Odéon. 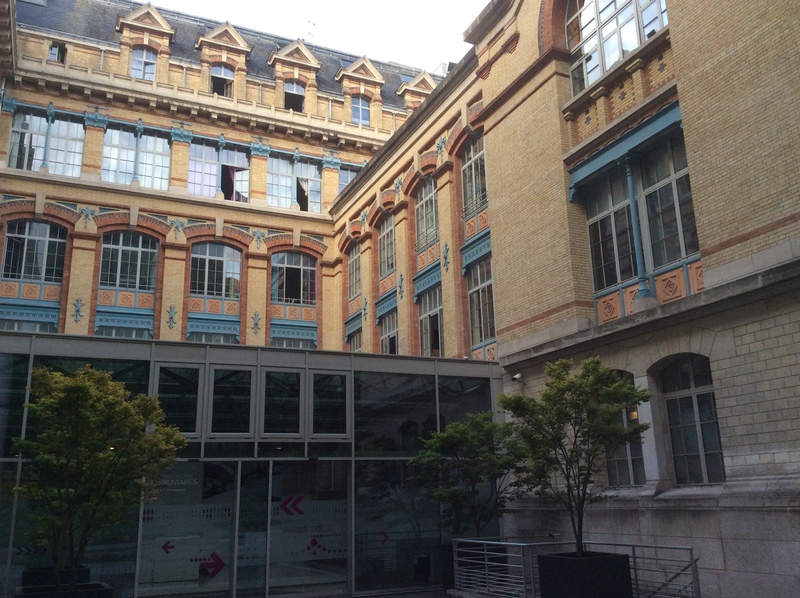 It’s above the Librairie (bookstore) Guelegaud. I discover a fun fact: it’s next to the building where Sylvia Beach published James Joyces’ Ulysses in 1922. As I’ve mentioned in this series already, Thomas Jefferson was quite the theater-goer, and from 1784 and onwards, he often attended performances at Theatre Francais, later the Theatre Odeon. He saw the 16th performance of Baumarchais’ Mariage de Figaro there on Aug 4th, 1786. 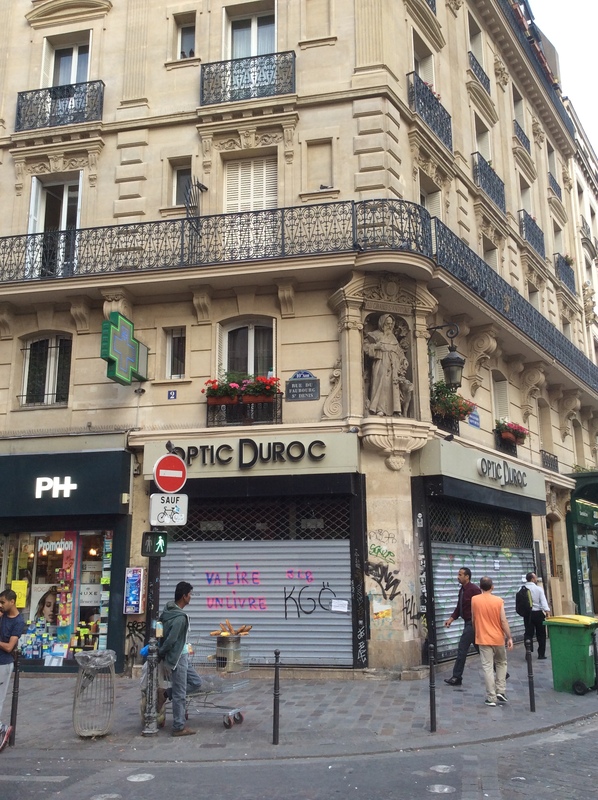 The Odeon is at 2 rue Corneille near the convergence of place, rue, and currefour de l’Odeon. The front door of the theater opens to a lovely foyer, but almost immediately after I go inside, the guard at the front door pounces on me, informing me that taking photos inside is forbidden. I explain the object of my trip and he becomes a little friendlier, but still says no, since the video cameras would reveal he let me take photos without official permission, which I could seek by writing to the building’s administrators when they return on September 1st. Oh well. There’s always the website! 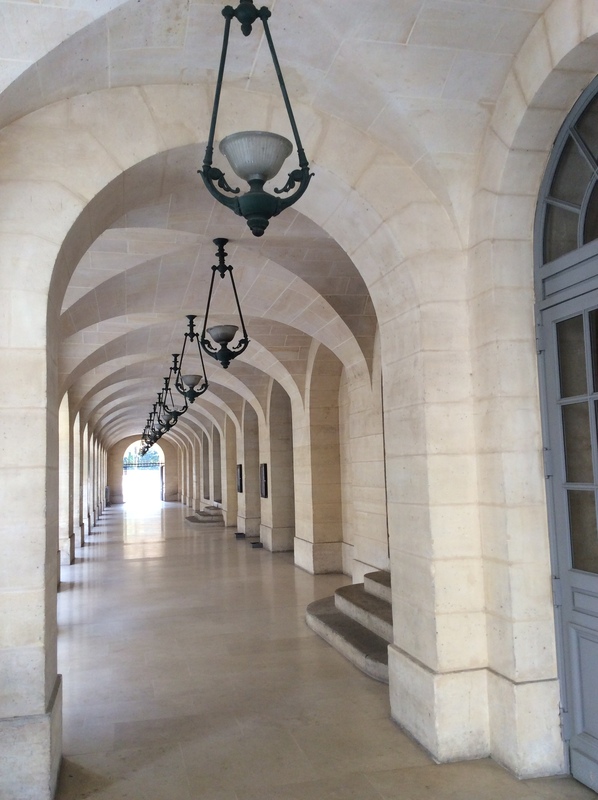 I go around to the side to see if I could find a historical marker or plaque, passing through an elegant vaulted promenade lined with hanging lamps, then walk all around the building. No luck. It’s a very lovely theater, someday I hope to go inside. 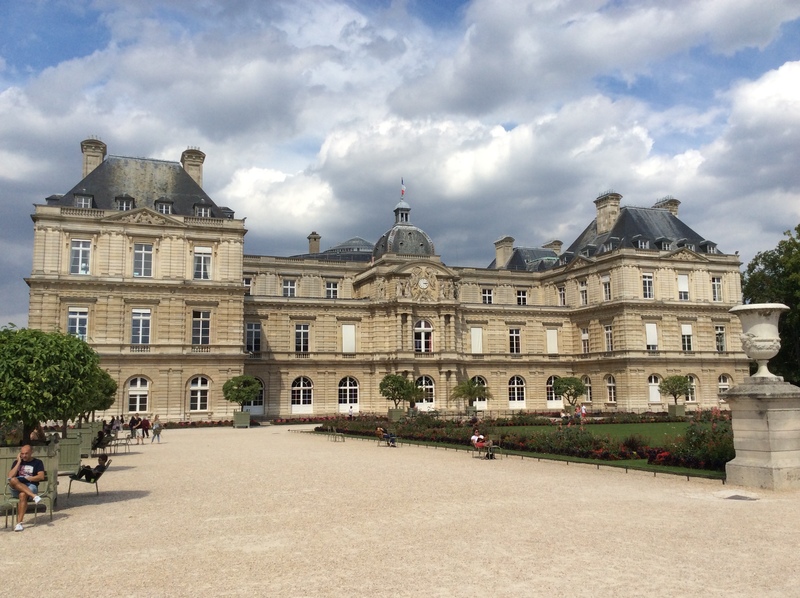 I head down to the Luxembourg gardens and palace. 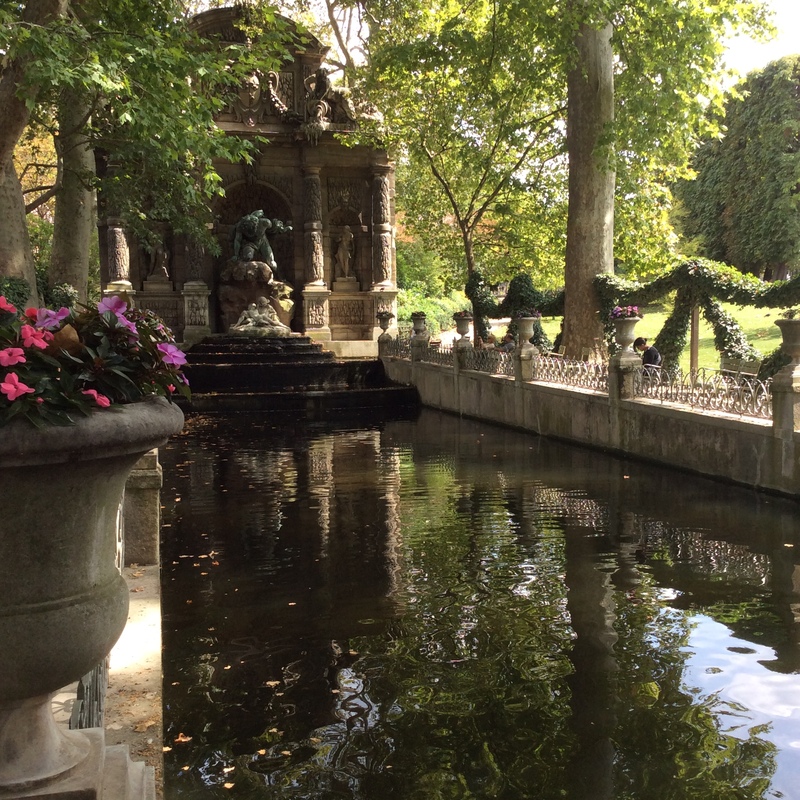 After I do a little photography of the informational signs and before I do my historical explorations, I sit down to eat my lunch and do a little writing at La Fontaine Medicis, a beautiful little rectangular pool below an ornate fountain. It’s a lovely day, balmy with a cool breeze blowing and partly cloudy, a relief after the first week of oppressive heat, though the warm evenings were a definite upside. Today’s the day that many Parisians open up shop again, having been away for vacation for the last month, and I’m sure they’re very glad at being welcomed back home by the beautiful weather. 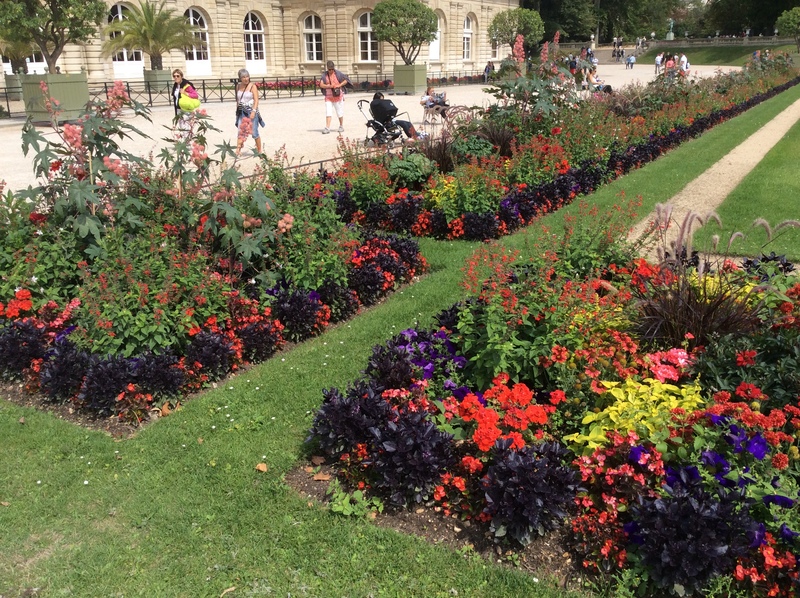 The Jardin de Luxembourg is a very happy place, a mix of formal geometric gardens and meandering paths among beautiful trees and flowers, more like botanical gardens. 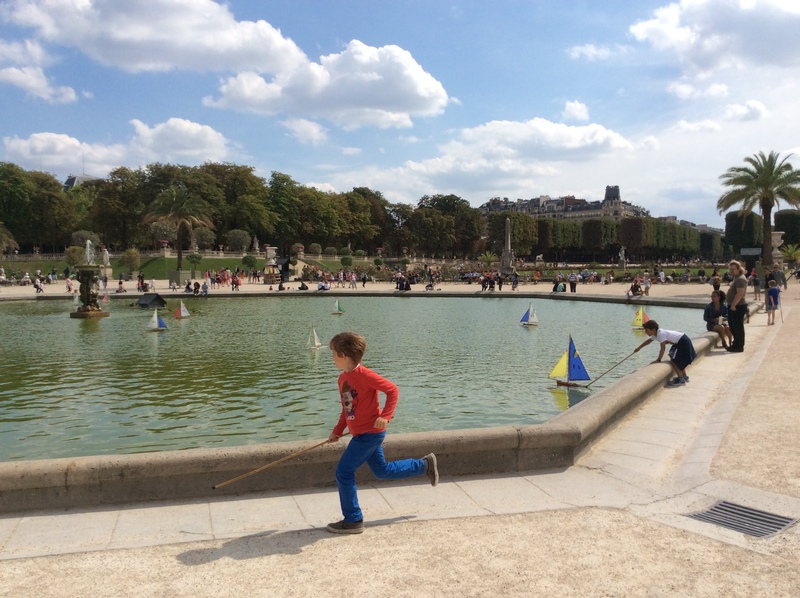 People are picnicking and sunning themselves by the dozens, and children are sailing their little boats in the big reflecting pool. It’s a far cry from the dark days of the Terror when the Luxembourg became a prison, albeit one of the better ones, reserved for prisoners who even the architects of the Terror felt deserved some respect. Paine, after all, was still one of the revered fathers and authors of the Revolution of France as well of the United States. Robespierre turned against him because he was growing increasingly paranoid and suspicious, as his overweening pride of power turned to bloodlust for the Revolution’s enemies, real or imagined. This came to include all foreigners, so despite his status as an honorary citizen of France, off to prison went Paine. He spent over ten months there, watching in horror as old friends, and new ones he made while in prison, were carted off to the guillotine. Mary Wollstonecraft visited her good friend Paine her, along with other friends and like-minded people imprisoned here at this time. Paine was popular with his prison mates and made a lot of friends. This was a good thing, too, since Paine eventually fell seriously ill with typhoid for the second time, and again nearly died from it, probably only saved because of the good care taken of him by his new friends, one of which was a prison guard. There’s a story, probably though not certainly true, that Paine was finally assigned his turn for the guillotine. The doorway was marked with chalk accordingly, but because Paine was boiling with fever, the guard allowed the door to remain open to cool the room. When the man came to collect those condemned to die, the door had since been closed, concealing the chalk mark, so Paine was passed over. Why the mistake was never remedied is never explained, which casts some doubt on the story. Perhaps the author of Common Sense and The Rights of Man was still just too valued and his would-be executioners lost their nerve, who knows? It’s a great story nonetheless. I head for my last historical excursion for the day: the Pantheon. 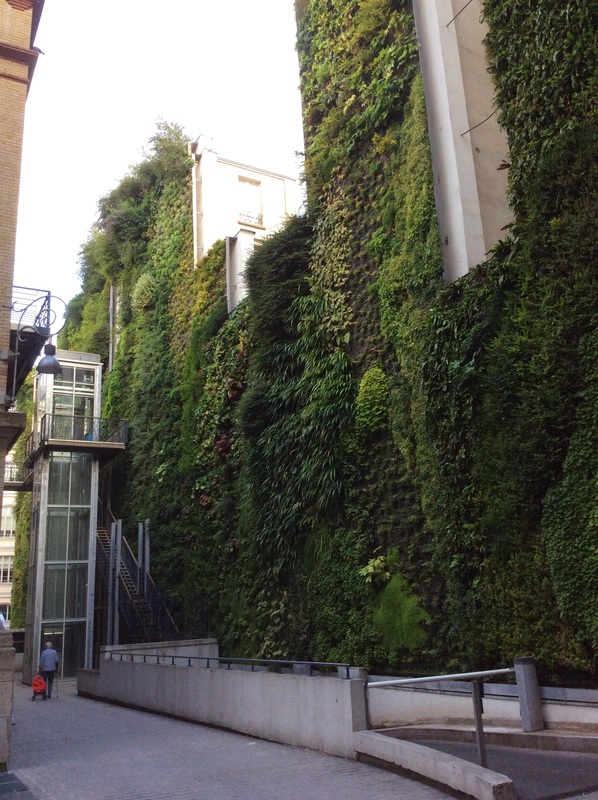 I had seen the building’s exterior when in Paris seven years ago, and had promised myself to go inside next time. Today is the day! 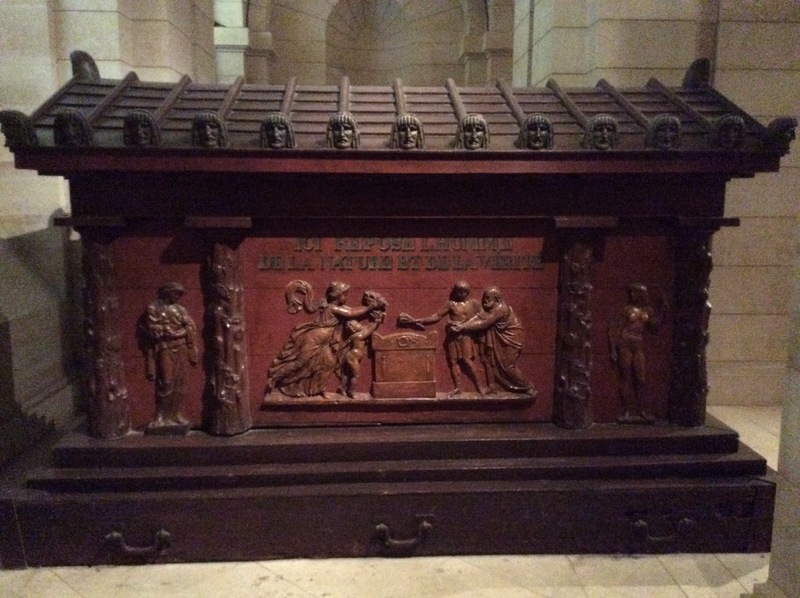 Formerly the basilica of Saint Genevieve, it was decommissioned as a reliquary for the bones of this beloved and ancient patron saint of Paris and made a temple dedicated to the intellectuals and great people of France during the French Revolution. Thomas Jefferson greatly admired this incredible monument, modeled on the classical ‘temple of all the gods, and visited with his new friend and platonic lover, the beautiful and consummate conversationalist Maria Cosway. As beautiful and perfectly designed as it is on the outside, the inside is stunning. The dome soars high overhead, but right now it’s covered on the inside by a screen showing the faces of people from around the world. It’s currently being renovated, as you can see from the scaffolding and supports around the dome from the outside. It’s massive, and the enormous frescoes add color and light to the place, which is otherwise maybe just a little too dark and somber. It had originally been designed to let in a lot of light, but many of its windows and open spaces were walled up since 1793, four years after Jefferson’s time in Paris, because the architect charged with transforming into a mausoleum thought it should have a more solemn look and feel. 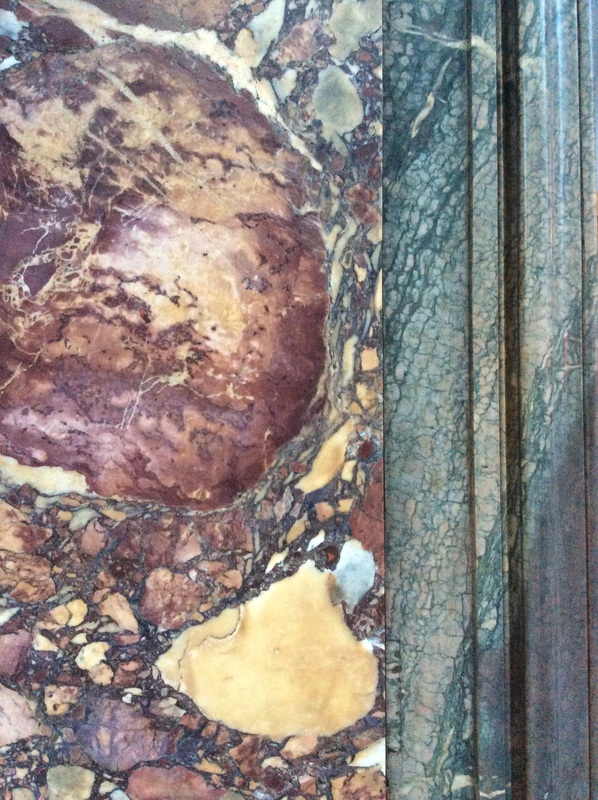 The Pantheon was never restored to its original open design, and perhaps the walls remain because the frescoes they contain are just too beautiful to tear out. 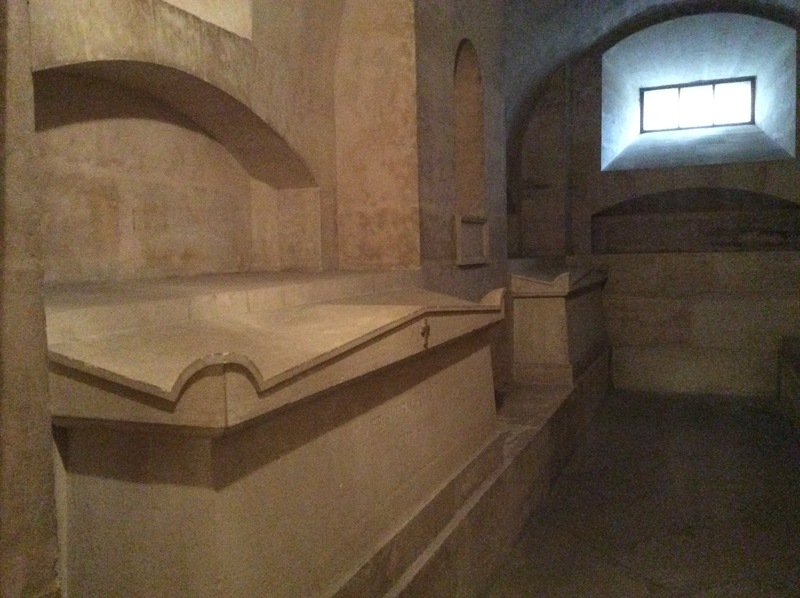 Condorcet’s tomb is here, though his actual remain are lost. 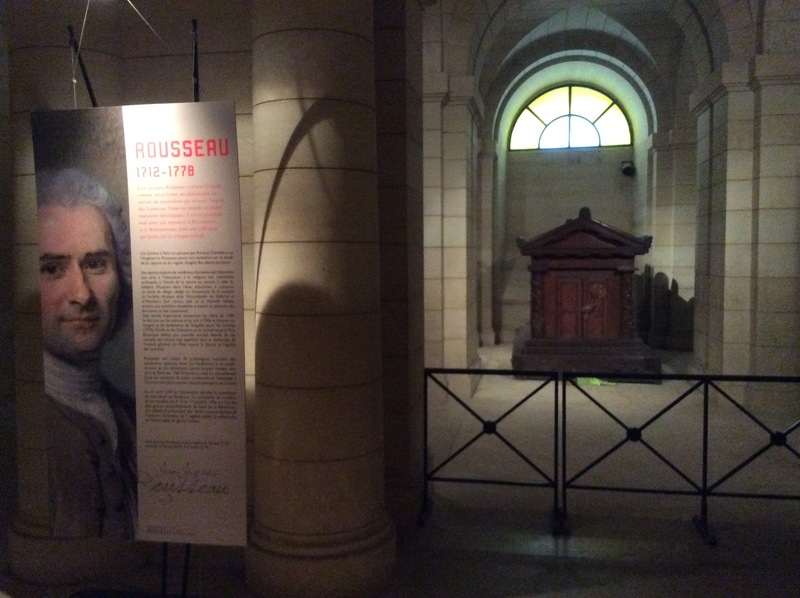 Voltaire and Rousseau are actually interred here: their tombs are placed opposite of one another, on either side of the central main aisle of the crypt. They were in many ways opposites in thought: in general, Voltaire emphasized the Head, Rousseau the Heart; Voltaire was a satirist, Rousseau a romantic; Voltaire critiqued all religions, Rousseau though being religious was important but also though all were equally valid: Voltaire loved science and culture, Rousseau thought that all that removed human beings from their raw ‘natural’ selves was corruption, and so on. 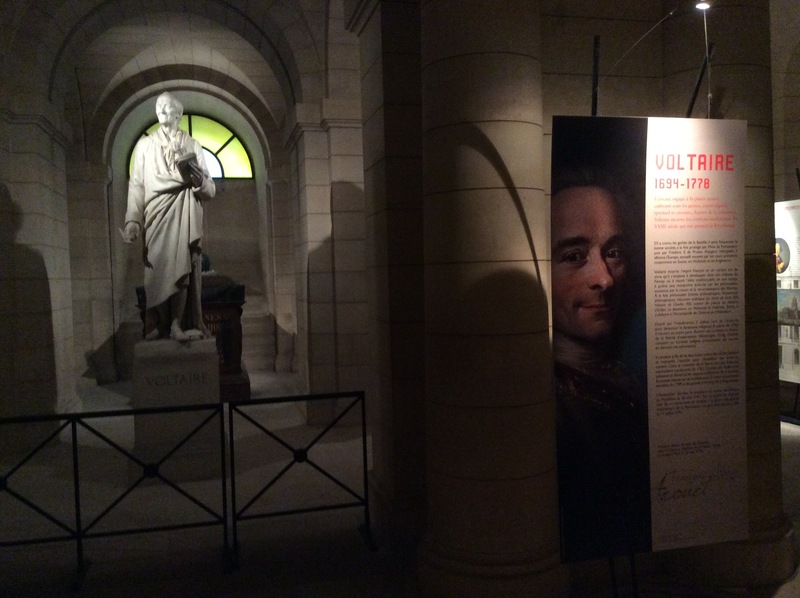 I love how well thought out their final resting places are arranged: the statue of Voltaire has a genial expression, as if looking around the room, ready to enter into witty repartee with one who has the time to stop and chat. 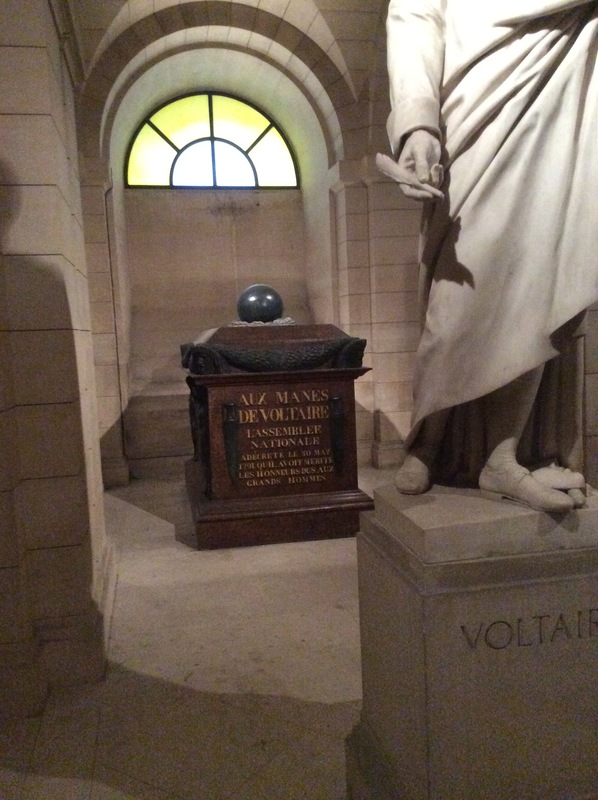 Rousseau has no statue, but the tomb of this incurable romantic is carved with a facsimile of his hand reaching out to offer the world a bouquet of flowers. All three of my subjects, Paine, Wollstonecraft, and Jefferson, read Voltaire and Rousseau and were very much influenced by them. Wollstonecraft, in particular, was very critical of Rousseau’s views on women, especially regarding education and their ‘natural’ roles in society. Like the others, however, she admired his defense of the natural origins of human rights. Well, this has been a particularly long, fascinating, and beauty-filled day, yet there is still much more to come of my journeys in Paris. To be continued in Part 4…. …From the Opera Comique (formerly Theatre des Italiens), I head south towards the Seine and past the Bourse (a center of commerce) to White’s Hotel, Hôtel d’Angleterre in French, also called the Hôtel de Philadelphie at that time, perhaps because of the French admiration for the new American experiment in self-government centered in Philadelphia. 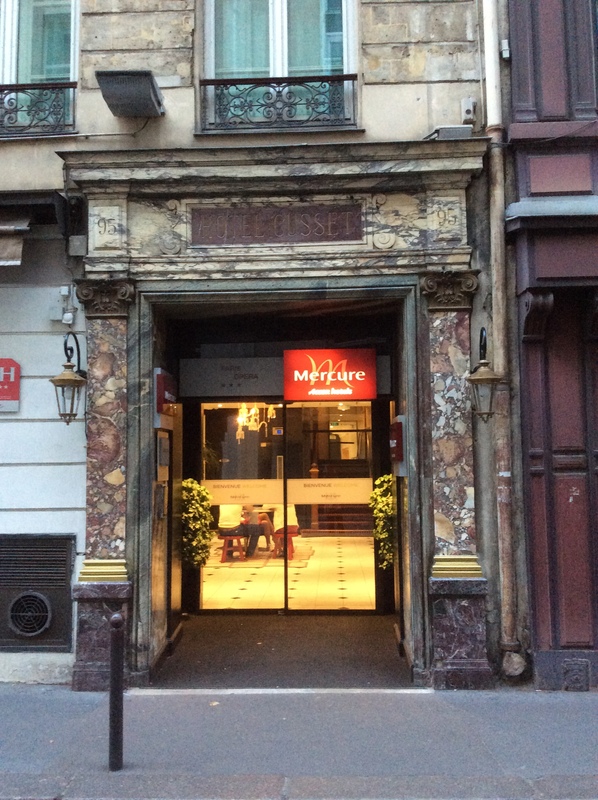 Mary Wollstonecraft, initially a little depressed and lonely at the house on rue Meslay, began to meet with a group of expatriates who gathered and dined here at 7 Passage des Petits Pères, just off the square in front of Basilique Notre-Dame des Victoires. One of these expatriates was our man Thomas Paine, who lived here intermittently in 1792 and 1793. I don’t find a building with this address on it, though it appears it would have been to the left hand side of east-west entrance to the Galerie Victoire, at the end of the passage farther from the basilica. 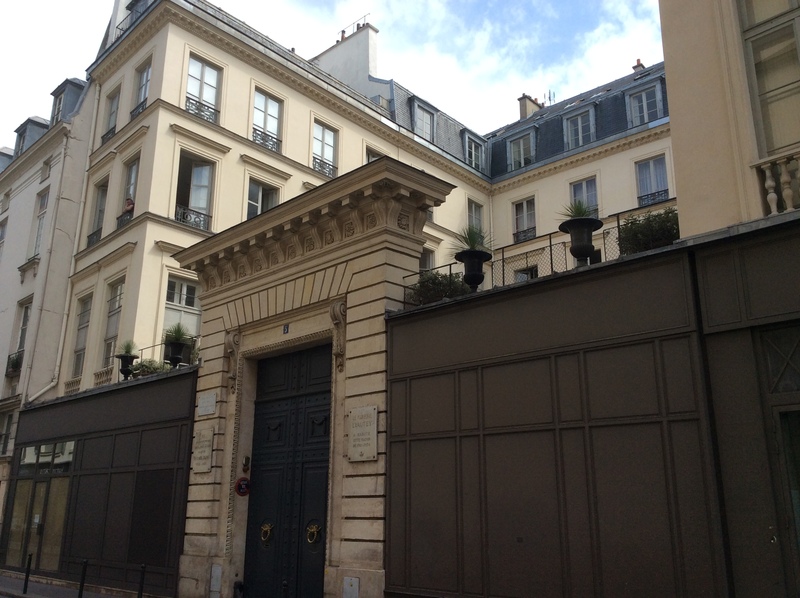 Paine finished the first part of The Age of Reason here, where he moved again after his stay at the mansion farmhouse on rue du Faubourg Saint-Denis. He smuggled the manuscript to his friend, diplomat and poet Joel Barlow (who I mentioned in my previous Thomas Jefferson series), for safekeeping at the time of his arrest in December of 1793, in hopes that Barlow could have it published while he was imprisoned. 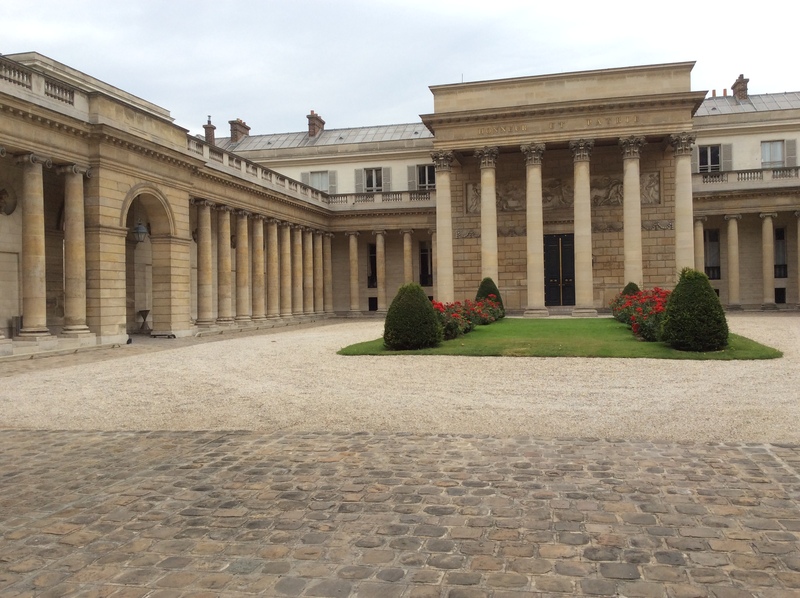 The next site I visit is the Palais Royal, just down the way towards the river. 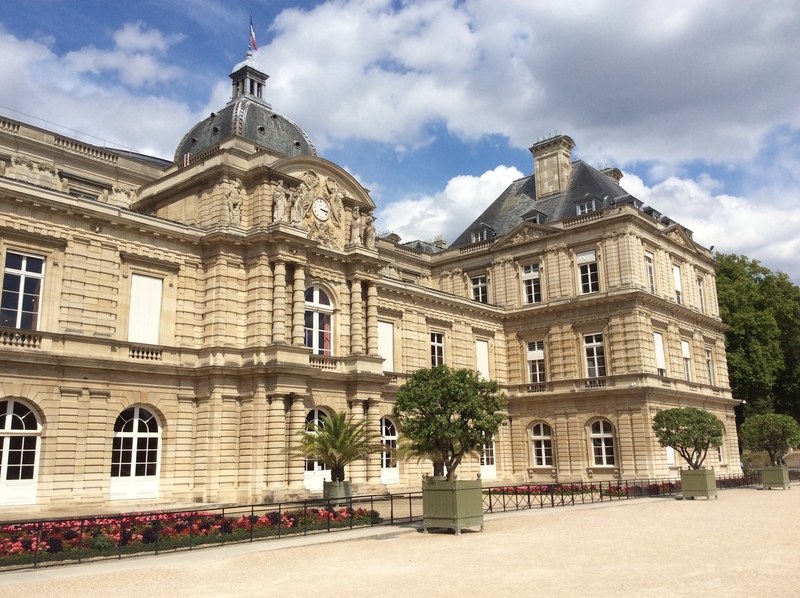 Thomas Jefferson visited the Palais Royal on August 6th, 1786 and other occasions (it’s especially easy to track the movements of Jefferson, being a prolific letter writer and meticulous record keeper). 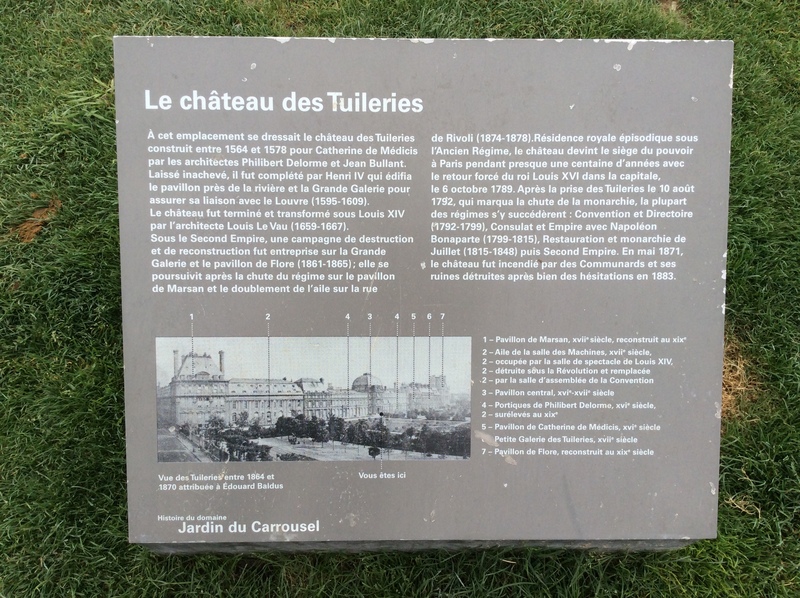 The Palais was a public shopping, entertainment, arts, and business center, originally the home of Cardinal Richelieu for whom the street that runs parallel to it is named, then expanded and updated by the Dukes d’Orleans. It was known for attracting revolutionaries, dissidents, writers, Freemasons, and prostitutes. I approach it from the back garden area, enclosed and crisscrossed by collonades in a classical style, a later addition that Jefferson would certainly have approved of. It’s a lovely shady spot to rest in on this hot day. I continue on towards the Seine and pass through the front courtyard of the Louvre, where the main entrance and the famous glass pyramid is. Thomas Paine visited the Louvre several times some years before the dangerous period of the French Revolution. After the American Revolutionary War ended, he found himself without an active cause to support, and turned to science, one of his other main interests. He was elected into the American Philosophical Society in 1785, founded by his great friend and mentor Benjamin Franklin (I write about my visit to the APS headquarters in an earlier piece), which was an illustrious company of scientists, inventors, and other innovators in various fields. Paine had been inspired, during his previous visit to Paris in 1780 to help negotiate a loan for the American revolutionary cause, by a design proposal for a new type of pier-less iron bridge; the usual materials used at the time were wood and stone. He thought he could improve the design, and spent about a year working it out and creating a detailed model with a craftsman named John Hall. When it was finished, he was disappointed to find that no one was willing to fund the building of such a bridge in Philadelphia or anywhere else in America; it was just too expensive and risky an undertaking when just about everyone with means found their resources strained by war debt. 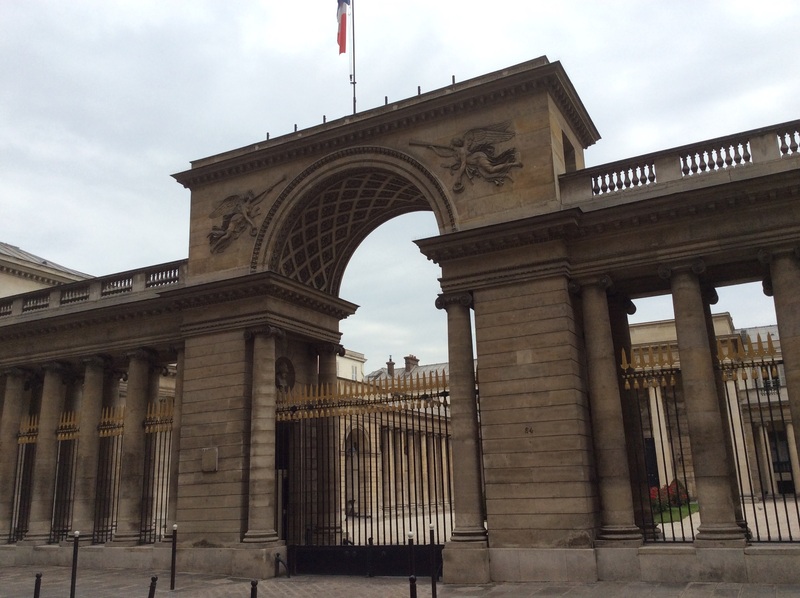 So Thomas Paine went to Paris again in 1787 for a time to present his plans for the iron bridge to the Academie des Sciences of France, which met here in the Louvre until the 1790’s. Perhaps the French, who had so lavishly supported the American cause, would like to be the first have such a marvelously inventive new type of bridge over the Seine, surely they could use one more in such a busy riverside metropolis. 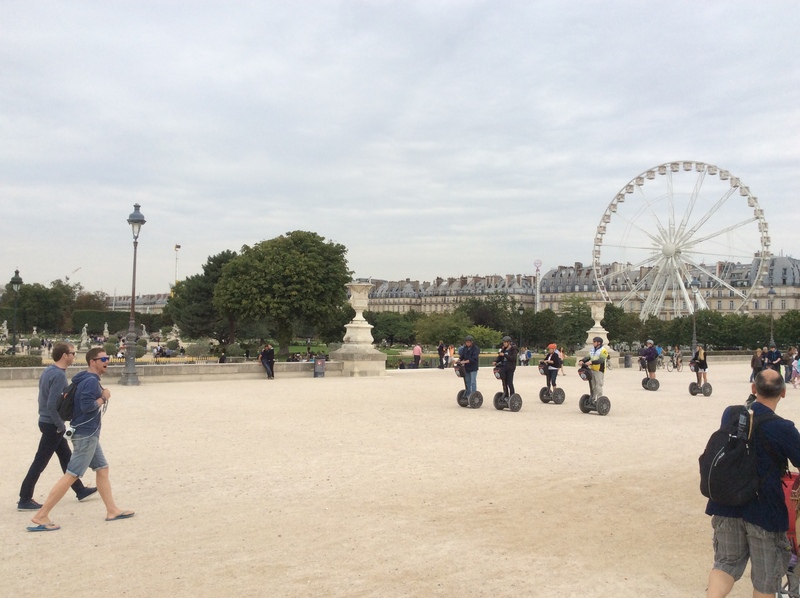 I walk along the Tulieries gardens in front of the Louvre (more on this place in a later piece, since it has significance for my visit, but there’s something I’d like to confirm first), headed for the Place de la Concorde. In June of 1793, Mary Wollstonecraft moved to Neilly-sur-Seine, west of the city and north of the Bois de Boulonge. She had fallen deeply in love with an adventurer, and as it turned out, womanizer, named Gilbert Imlay. For a person who described herself as so wedded to reason, she was prone to allow her emotions to overwhelm her when it came to love, and no one would do but exciting yet unsuitable men who broke her heart every time. Imlay was one of these, and she went to Neilly-sur-Seine both to escape the deadly excesses that the French Revolution was falling into, and to pursue her love affair in private. Imlay remained in Paris, but they would pass back and forth to visit one another. 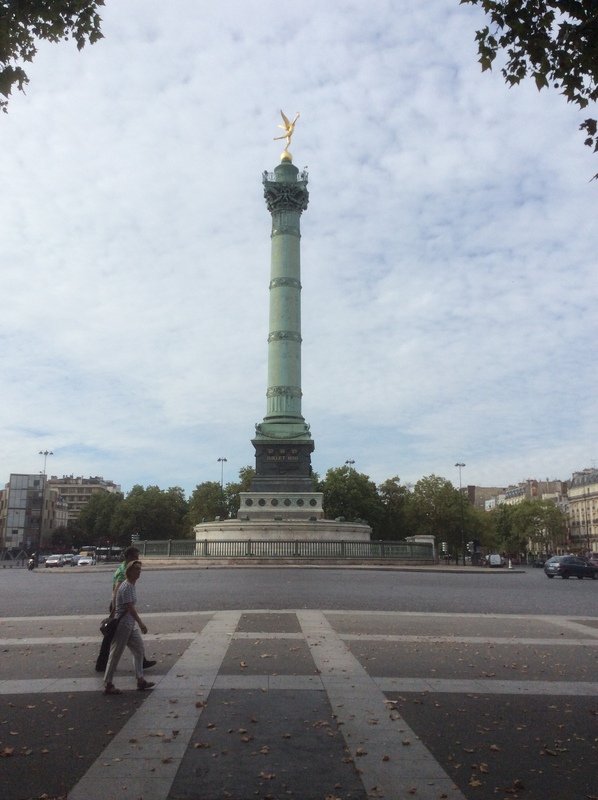 She would enter Paris through a gate at the Place de Louis Quinze, now called the Place de la Concorde. She described, on one occasion, slipping in the blood of executed victims of the Terror as she passed through the gate, as a well-used guillotine was set up here. Like Paine, the Revolution broke her heart: it was so full of promise, yet here its leaders were, becoming the oppressors they had professed to hate. 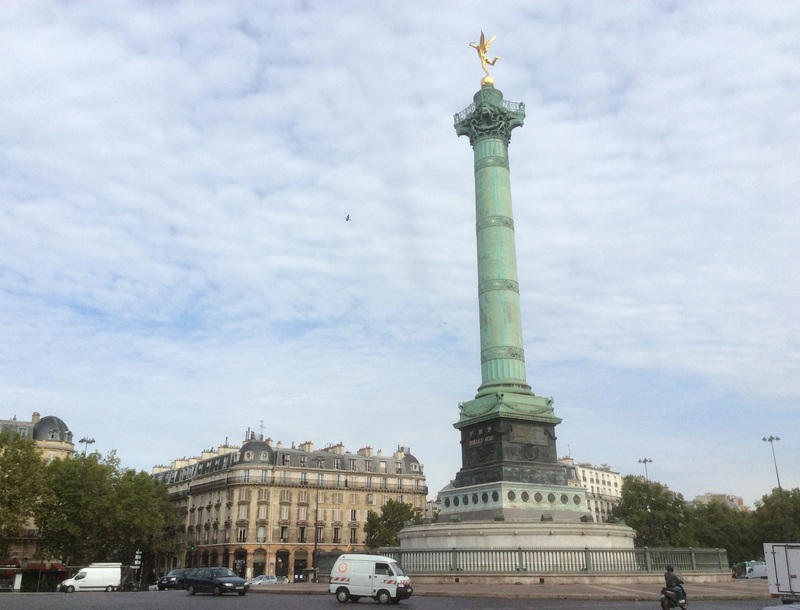 Next, I head east along the Champs-Élysées, where Thomas Jefferson finally settled down in the autumn of 1785. He lived here at the Hôtel de Langeac until he returned to America in September 1789. It’s right on the corner of Champs-Élysées and Rue de Berri, in the new quarter named Faubourg du Roule that Louis XV had built. He had moved from place to place in his first year here in Paris, renting rooms, staying with friends, and remodeling the Hotel Taitbout to suit his tastes. He changed his mind about living there, however, since it was so expensive, and he had already spent a quarter of his yearly budget on the place. Jefferson habitually lived far beyond his means, and American Congress, having little power to tax, did not regularly pay expenses of its ministers. So, Jefferson sold up and moved to the Hôtel de Langeac. It turned out to be a perfect compromise between his love of culture and its refinements, and his moral preference for rural living. At that time, it was on the outer edges of Paris, halfway between the bustle of the city and the peace of the Bois (woods) de Boulogne, which he visited nearly every day. Horseback riding was among his favorite forms of exercise, and he could let the horse really go in this natural setting. Now, however, the full bustle of Paris has enveloped Hôtel de Langeac’s street corner and beyond. As I was absorbed in finding a good angle to photograph the building, I was startled to realize that some of the honking and shouting I was hearing in the background was aimed at me: turns out I was standing right in the driveway of a subterranean parking garage, which lets out right in the middle of a wide sidewalk. Oops. At this point, I’m regretting the pace at which I toured the city today. My knees ache terribly, especially the right one, and I’m disappointed in myself. I’m an avid hiker and consider myself an able and enthusiastic walker, but today’s tour did me in. Then I remember: I had just been sitting for hours sleeping with my legs all twisted up in the cramped space in front of my airplane seat, so my knees had likely been strained. Next time, I’ll pace myself appropriately. In the meantime, I buy a tall can of Hoegaarden (a favorite ‘easy beer’) and some snacks, and sit by the Seine writing notes under a shade tree; it’s a lovely way to rest. I recover a bit, then stroll some more through the Latin Quarter. It’s touristy to the nth degree. I wish I could have seen it decades ago when it was still bohemian and more interesting, but I do appreciate seeing so many people out on holiday having a good time. 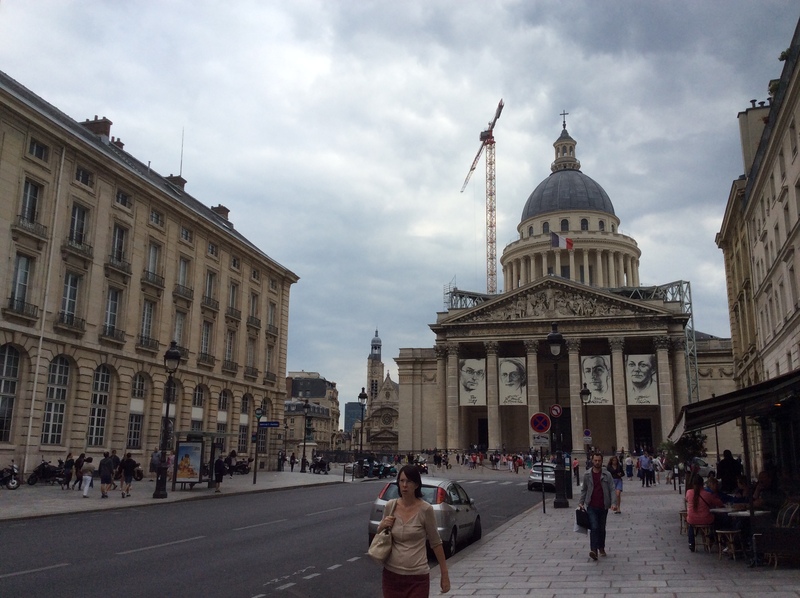 I pass by at the Pantheon, which so inspired Thomas Jefferson, in the early evening, after I had resumed my stroll but paused my historical explorations, simply wandering wherever street, garden, or structure beckoned. At this hour, it’s closed to the public. I consider where to go next: I’ll be meeting up with my husband at Gare du Nord tomorrow morning, so I need to get out the house in good time. He’s flying in with his fellow randonneurs and his bike and cycling gear to ride Paris-Brest-Paris, a 1200-kilometer cycling event that’s been put on every four years for over a century. Before the big ride, we’re taking a detour to Berlin to visit family for a few days, then I’ll see him off on his ride and return to Paris. I’ll be returning to the Pantheon then for a real visit, and to continue my adventures following Thomas Paine, Mary Wollstonecraft, and Thomas Jefferson. ‘French Revolution.’ Wikipedia, The Free Encyclopedia., Jul. 17 2015. ‘Palais-Royal‘, Wikipedia, The Free Encyclopedia. I get up at a decent hour, though of course not too early: I discovered early on when I began to travel in earnest that proper rest is essential for clear thinking, map-reading capabilities, and the good humor necessary for enjoying the day. Since there’s such a huge number of sites to visit on my itinerary, I’ve decided to visit them in an order determined not by subject nor in any kind of chronological order, but by proximity to one another, so I can better cover them all. I make my way from my temporary digs on Boulevard Voltaire up toward Republique, then make a soft left and head for 22 rue Meslée (now called the rue Meslay). Mary Wollstonecraft lived here at her friend Aline Filliettaz’s house from December 1792 through June of 1793, shortly after arriving in Paris. Wollstonecraft was full of hope for the Revolution and longed to be a part of it, and thought that the humanitarian and egalitarian Enlightenment principles she espoused were more likely to take hold there before they would in her home country of England, as they had (to an extent) in America. By the time she arrived in Paris, she was a self-made woman, a governess and schoolmarm who had become the bestselling author of two progressive and highly influential books, A Vindication of the Rights of Men, 1790 (a scathing rebuttal to Edmund Burke’s Reflections on the Revolution in France) and A Vindication of the Rights of Woman, 1792. By the way, it’s important to make this point at the beginning: as is the case with all private residences and some other sites I visit during this tour, unless I can find a clear indicator of the history of the building (in accounts I have access to, on plaques, on cornerstones, etc), it’s very possible that I may not have found the exact location, especially if it’s not a public building with a clearly documented history. Many of my sources list an address without specifying whether it’s the modern address or the historical one and numbers change over time, and some streets are re-routed or disappear entirely, as do many of the original buildings, and records are not always consistently kept or may have been lost in the intervening years. Since my subjects were all here well over two centuries ago, it’s likely that at least a few of these locations are approximate, rather than the exact sites, despite my best efforts to discover them. This is especially true of Mary Wollstonecraft since she’s the only one of my subjects who never held public office or had any government appointments. 63 rue Faubourg St-Denis, Paris, France. It’s the right address but not actually the site of Paine’s once-time residence, since the address had changed since his time. You can the story of how I find the true site here. For example, poking around for historical details of the rue Meslay, I found that George Sands was born on that same street, and the address was 15 in her time, 46 now. I didn’t find any info as to whether Wollstonecraft’s 22 address is the new one, old one, or just that same address in different sources, but since she described seeing the King’s carriage pass by her window on the way to trial, it may be that the Filliettaz house was further up the street, in a taller building or at a higher elevation, so that she could see as far over as Boulevard Saint-Martin, the next street over and the route he would taken. But another source describes the house as having six stories, and the house now at 22 matches this description. If I have time, I might swing back over there for further explorations since the place I’m staying now and the place I’ll be staying when I return to Paris (I’ll be joining my husband Bryan tomorrow for a quick family visit to Berlin, then to Saint Quentin en Yvellines where he’ll commence the Paris-Brest-Paris cycling event) are not too far away. 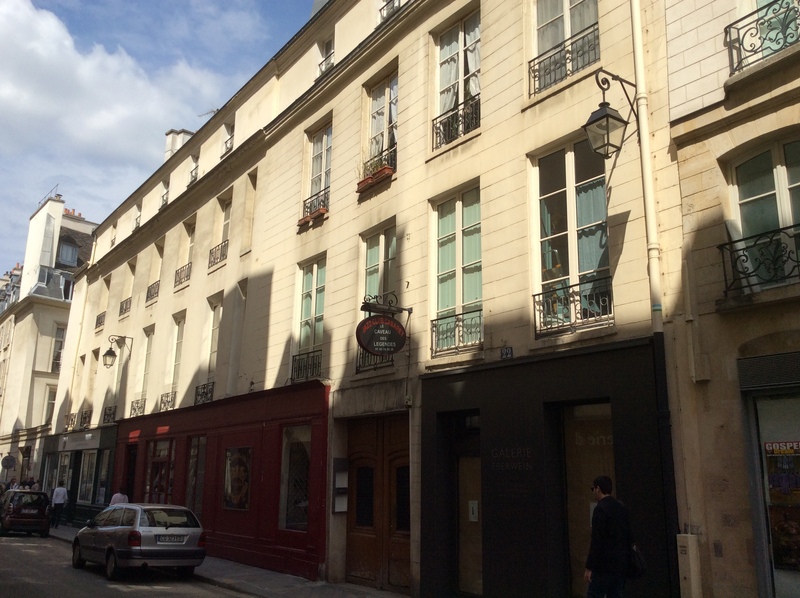 Next, I head for 63 rue Faubourg St-Denis, at rue des Petits Ecuries, where Thomas Paine moved in 1793 to share the ground floor of a ‘mansion farmhouse’ with six friends. Paine wrote in glowing terms of the lifestyle there, and they had farm animals and grew fruits and vegetables, as that area was still pretty rural, and they would romp in the garden to take their minds off the tumult and violence in Paris. He was living here when he, with a committee of nine others, drafted a new constitution for France, though this one was unsuccessful: the Girondin faction which Paine worked with were moderates, while the radical Jacobins were gaining power and, over time, took over the Revolution entirely, instituting the Reign of Terror. 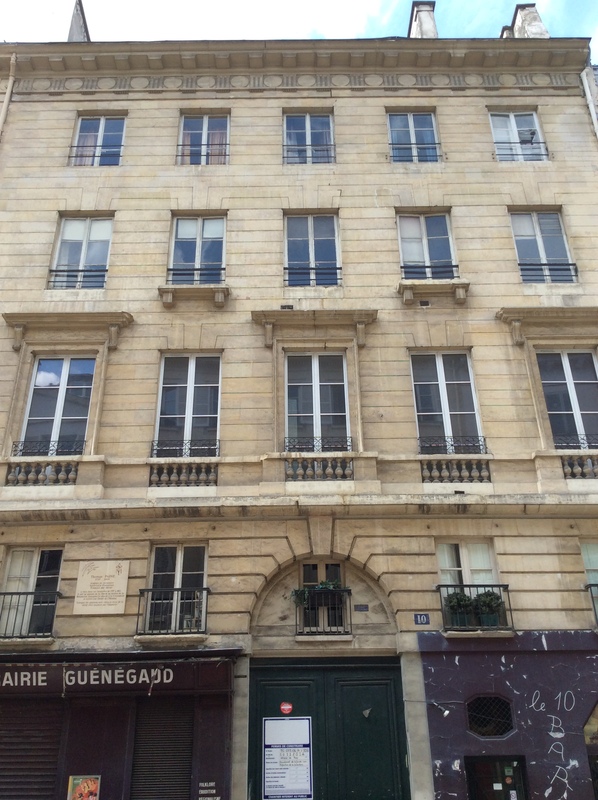 (See update on the search for the rue Faubourg Saint-Denis house). It’s unlikely that any part of the building that stands here now is original, either in whole or in part, given Paine’s description of it, and the current address may not the same as the historical one [this turns out to be the case]. The only fruits and vegetables to be obtained here now are from the colorful produce shops that line this now urban, rough-around-the-edges but vibrant and colorful part of the city. I think this neighborhood is wonderful, and it reminds me in many ways of the Mission district of San Francisco before it became mostly taken over by hipsters and tech people. At 101 rue de Richelieu, Paris, France. 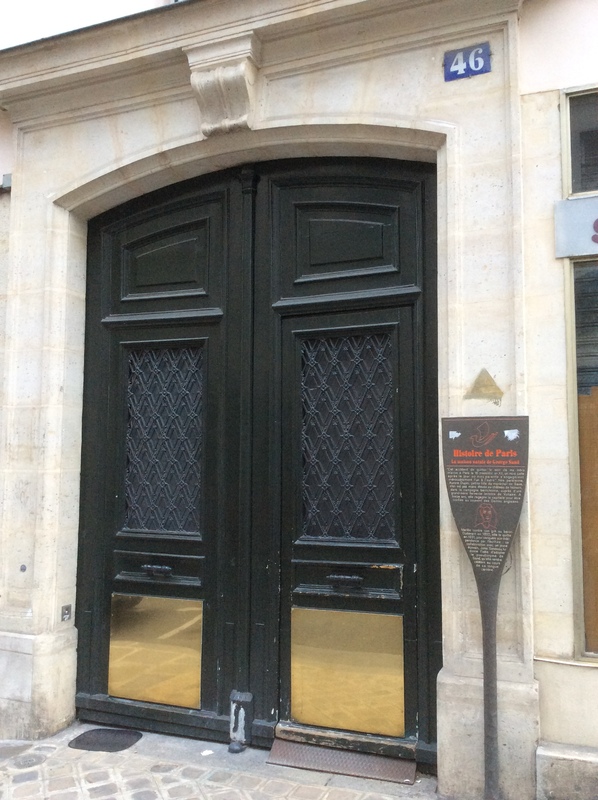 Next, I head down to rue de Richelieu in search of the place where Thomas Paine moved in with James Monroe’s family in November 1794. Monroe had finally secured Paine’s release from his eight-month imprisonment at the Luxembourg (I’ll return to this subject after I’ve visited that palace-turned-prison-turned-Senate house). Paine lived with the Monroes for about 2 years, not all of them here, since they moved more than once. 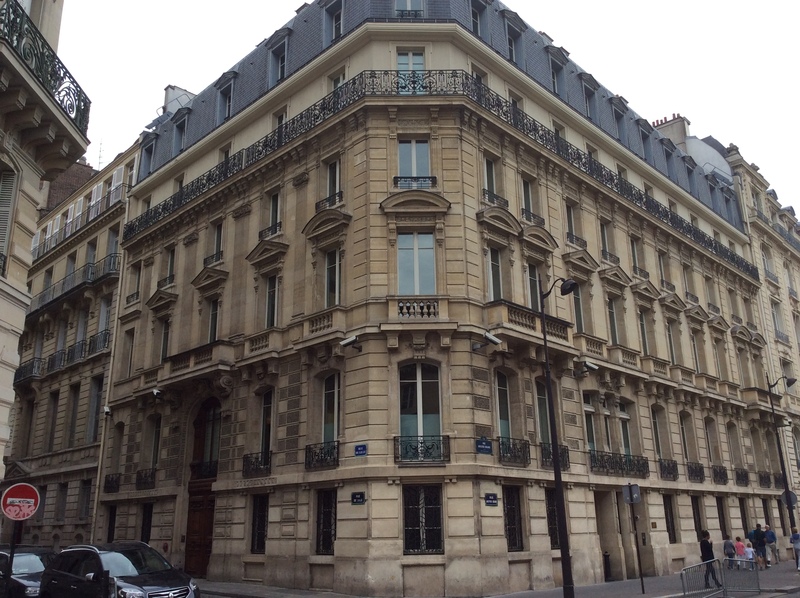 At the time of his release, they lived at 101 rue de Richelieu, which begins at Bd. Montmarte where it meets Bd. Poissonere, in the 2nd Arrondissement. When Paine was released from prison, he was broken down in health and spirits: he had nearly died from typhus, and he had an open ulcer on his side that wouldn’t heal. He had also felt that his American friends in high places had deserted him, not doing what they could to rescue him from his predicament. He was especially upset with Gouverneur Morris, the ambassador (then ‘Minister Plenipotentiary’) to France at the time, and with president George Washington. Morris was the primary author of the preamble to the United States Constitution as well as many of its other sections and he was an able statesman, but the French government lacked confidence in him; he was recalled after they repeatedly requested he be replaced by another. From their writings, it appears that Paine and Morris alternately liked, respected, and loathed one another. Morris often writes very sarcastically about Paine, and though I’m quite the Paine fan-girl, I find some of his remarks very funny and witty, though others are just plain bitchy and catty. While Paine did offer valuable assistance to Monroe (Morris’ replacement) in his role as the new American ambassador, Paine was at this time also, as an aftereffect of his imprisonment and disillusionment with the French Revolution, given to depression, anger, and paranoia, and as a result of all of these, binge drinking. He was to acquire a reputation as an alcoholic, but since these accusations came almost entirely from his political enemies during and after his lifetime, this characterization is suspect. His friends and colleagues describe him as a social drinker, wont to make merry in the evenings and engage in enthusiastic discussions about politics, science, and philosophical topics as long as anyone was willing. 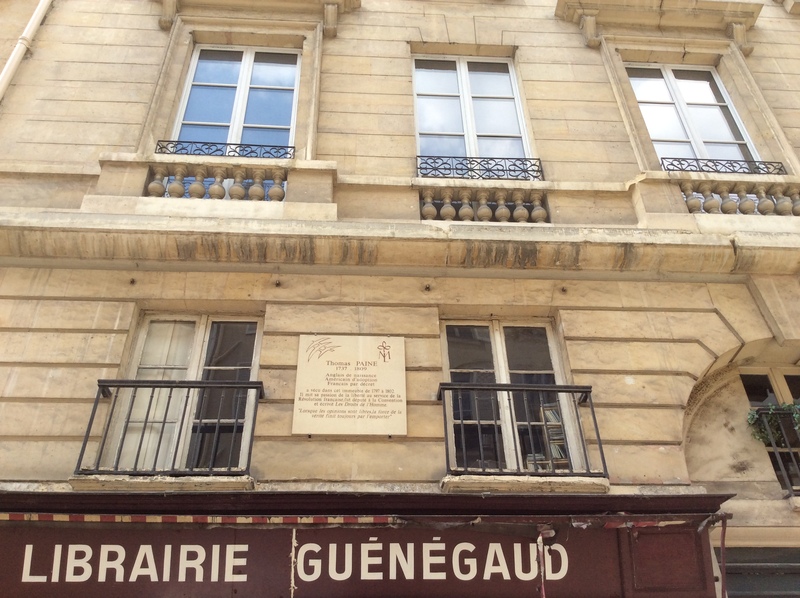 I next head north to rue Taitbout and turn left on rue de la Victoire, and go to the grand house at 60 rue de la Victoire, which was 6 rue Chantereine in Paine’s time, in the 9th Arrondissement. It was likely in this house that Paine attended a party thrown by Julie and Francois-Joseph Talma in October 1792. The house was owned by Mrs. Talma, formerly Louise-Julie Carreau, and she held a famous salon here. Her husband was a well-known actor and passionate Revolutionary, friends with Jacques-Louis David (who, I was surprised to discover was among those who voted in favor of executing the King) and Napoleon Bonaparte, who moved into this house in 1796 with his new wife Josephine). Like Paine and Wollstonecraft, the Talmas were Girondinist in their sympathies, yet there was a ruckus between Paine and other attendees of the party, many of whom had begun to turn on this once-beloved muse and author of two revolutions. The history of the French Revolution is, among other things, a prime example of how people, even as they see themselves pursuing the same lofty goals and are members of the same political party, just can’t seem to avoid petty infighting. This sort of thing undermines so many important projects, and as we see all too often, petty disagreements can devolve to self-righteousness and even blind radicalism over time. French culture, in that era especially, placed a high value on ‘sensibility’, valuing the free expressions of both raw and cultivated emotions. As we have also seen in the French Revolution, unbridled passion was very often allowed to trump reason. To Paine’s dismay, he watched the beloved Enlightenment campaign for rational democratic government, that he served so enthusiastically and so well, turn into a bloody campaign of vengeance and terror. 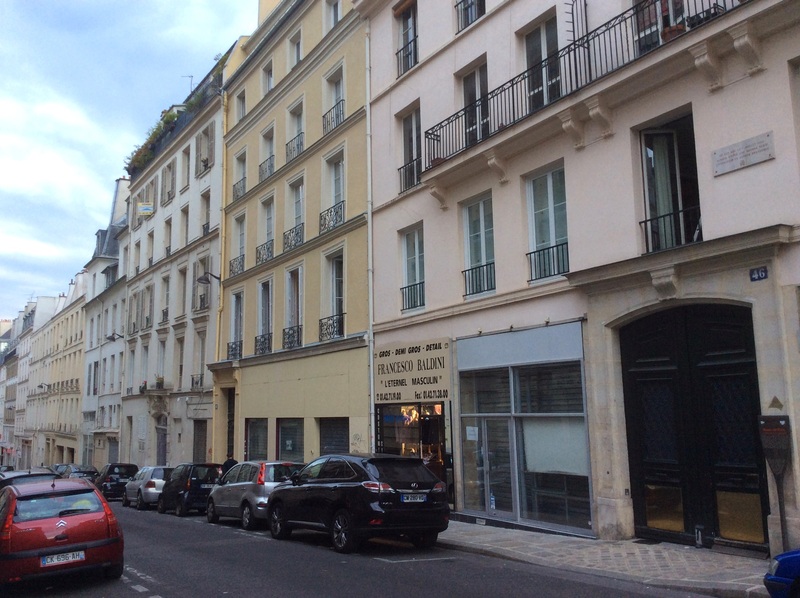 It was very near this place that Thomas Jefferson moved for awhile, eight years earlier in October 1784, on the cul-de-sac (impasse) Taitbout off rue La Fayette near rue St Georges. He signed a long-term lease at Hotel Landron, also called Hotel Taitbout, but only ended up living here for about one year. I explore this area very thoroughly, peeking into every courtyard, driveway, and byway I can find, but a hotel by this name is nowhere to be found so far as I can see. (By the way, ‘hotel’ wasn’t used in the same sense as we use it today: It could refer to a grand house or a large public building.) This area is very near where I’ll be staying next week, so I’ll return if I find more leads, and I’m looking ever more forward to doing so, it’s such a beautiful neighborhood. Jefferson was an avid patron of the arts, and attended the theatre often while living in Paris to see plays and musical performances. He often went to the Theatre des Italiens, very near his Taitbout place on Boulevard des Italiens. 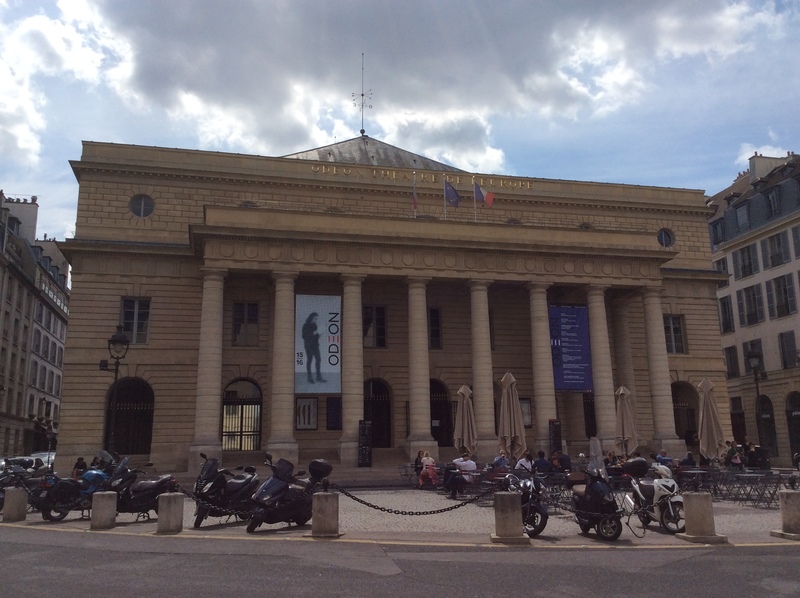 There is no theatre today with that name, but I find Opera Comique in just about the right place. Could this be the same building? The building appears to be of the right vintage. I look into it, and sure enough, it is! It’s in the process of getting a facelift and a good cleaning, but the side entrance is in good repair and attractive with its lovely cast iron lacy canopy. I still have many sites I’ll be visiting throughout the course of the day, so I’ll take a break here. I arrive at Charles De Gaulle airport on Sunday afternoon, fairly well rested for once. Usually, I don’t sleep well on planes, and stumble off the walkway groggy and stupified. This time I slept about two thirds of the way through the 10 1/2 hour flight …not well, mind you, but much better than nothing. I attribute it to the ibuprofen tablets I took shortly before boarding, making the cramped quarters less painful to sleep in: my travel tip of the day! It was great to arrive and feel competent to navigate the trains, find my destination, and go out and start enjoying myself without delay. 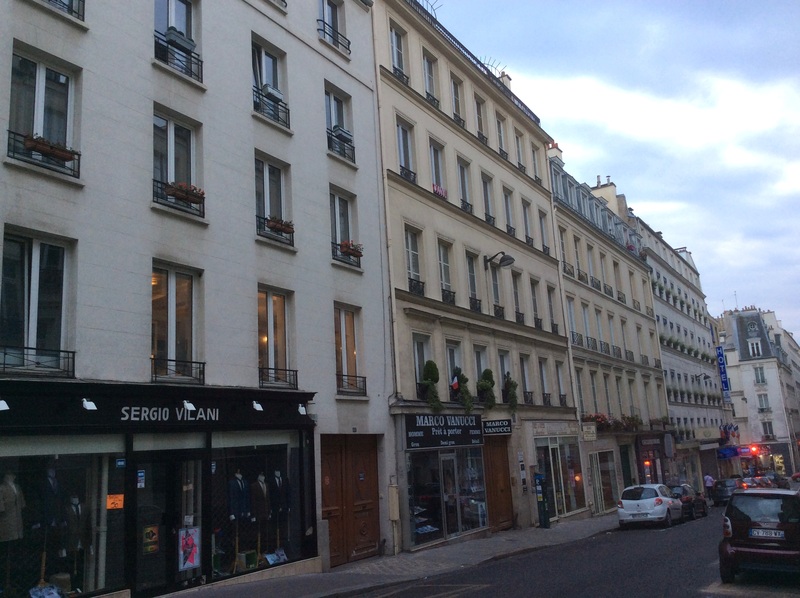 At about 6pm, I meet my host Aurelia at 46 Rue Voltaire, a couple blocks down from Oberkampf station, in the 11th Arrondissement. She is sweet and helpful, and a practiced Airbnb-er: she has a series of photos on her iPhone at the ready so she can show me how to navigate the passageways, six flights of stairs, and unmarked doors to reach my mini apartment. The place is tiny, with the loft bed over the desk, the toilet tucked into a cubbyhole beside the shower, and the whole place the size of a small bedroom. On the whole, it suits me just fine, since it’s clean, private, and in a great neighborhood at a cheap price, but being somewhat tall and not used to these close quarters, I whack my head often. I decide not to dive right in my historical adventures, but to take an aimless walk around instead, to get my bearings, wake up a little more, and re-immerse myself in this city which I last visited seven years ago on honeymoon. Right away, I find myself feeling a little wistful, feels odd to be here without Bryan. He’ll be joining me in a couple of days, so I console myself and head out. I walk down Boulevard Voltaire in search of something better to eat than airplane food, which takes me awhile: most places are closed (usual in late July to mid-August, as my host informs me), until I get closer to Place de la Nation, which is is getting busier as the night crowd are starting to emerge. I find a boulangerie, where I pick up a butter croissant and another sweet one for tomorrow’s breakfast. I admire the sculpture, then turn up Boulevard Diderot, sit down for an Edelweiss (lightly tart beer), a couple of smokes (an old habit I like to indulge myself in on special occasions) and a little people-watching. It’s a lovely warm evening. 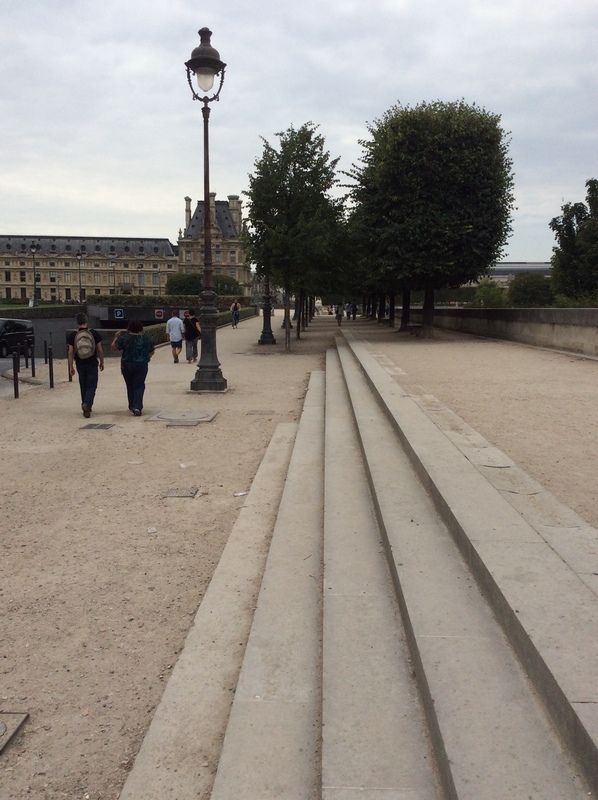 I continue on towards the Seine, cross the Pont d’Austerlitz, and walk east along the river. In the park and sculpture garden on Quai St-Bernard, I happen upon masses of people dancing on three dance floors: the first was dedicated to the foxtrot, the other two to Latin dancing. One was huge, must have been well over a hundred people dancing until the sweat was dripping, ringed by crowds of spectators. I dare not join in the dancing: I can’t seem to learn steps to save my life, last time I took a dance class I caught the teacher apologizing to my assigned dance partner, probably for the bruises I pounded into his feet with my own. The sunset is pink, orange, and gold against the blue sky and above the silver Seine as I pass by Notre Dame. On the bridge to the Île de la Cité, there was another crowd clapping and cheering for three performers, two on roller skates and one on rollerblades. In turn, they speed-skate up a ramp and over a crossbar set very high in the air, perhaps 15 feet or so. As I’m reminded constantly on my evening stroll, Paris, like our Washington D.C., has not forgotten its nation’s Revolution. 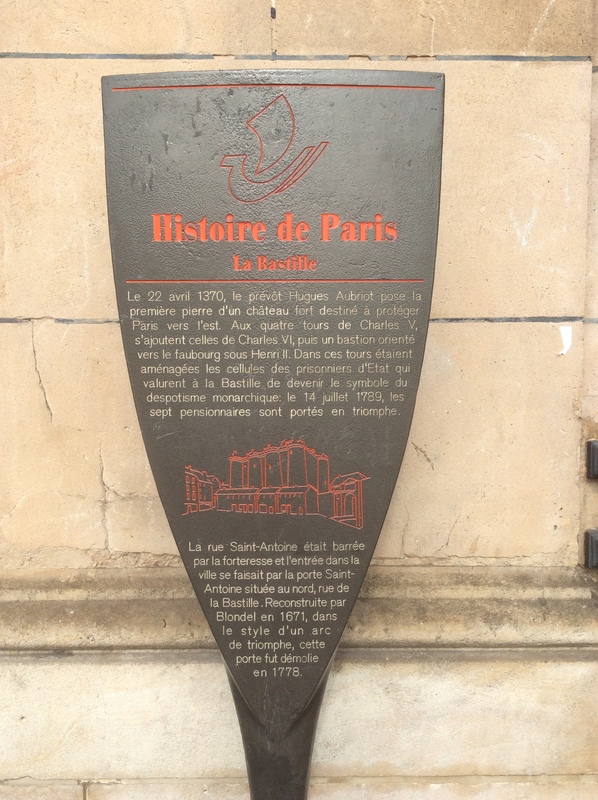 Its heroes and events are memorialized in the names of street after boulevard after avenue, in monument after statue after city square: Rue La Fayette, Place de la Bastille, Place de la Republique. 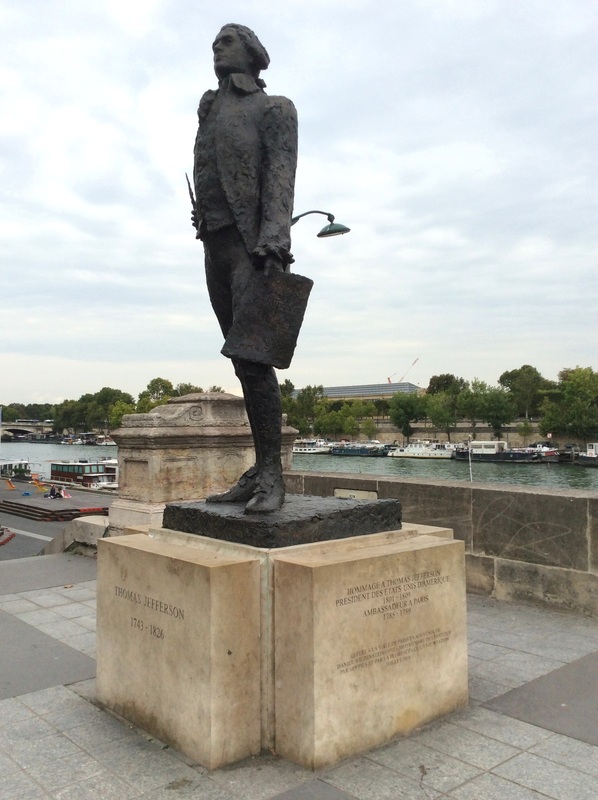 So are its philosophes: along with Voltaire and Diderot, there’s Jean Jacque Rousseau, Montesquieu… even our own Thomas Jefferson is an honorary member of this elite company: his larger-than-life bronze sculpture adorns the Left Bank of the Seine. associated with a subject of my trip: the Hôtel de Ville, which has several connections with the life of Thomas Paine. It’s a very grand building, and looks both lovely and impressive all lit up at night, but it’s not the original building of Paine’s time. That one was burned down in another French revolution in 1871, in the same round of anti-monarchical arsonists that claimed the Tuileries palace and nearly claimed the Louvre. I walk around the building to see if one of the statues in its many niches was Paine, but I can’t find one. It’s pretty dark out, though; the statues I see whose caption I can see in the half-light are all Frenchmen. However, Paine was a celebrity in France following his publication of Common Sense, which offered a comprehensive philosophical defense for the rightness of the cause for American Revolution, and again when he wrote The Rights of Man. His arguments resonated with many of the French people, who felt themselves chafing under a rigid hierarchical structure and high taxation maintained and imposed by an unchallengeable monarchy, aristocracy, and clergy. So it was at the Hotel de Ville on August 26, 1790 that the Paris Commune voted to make Paine an honorary citizen. 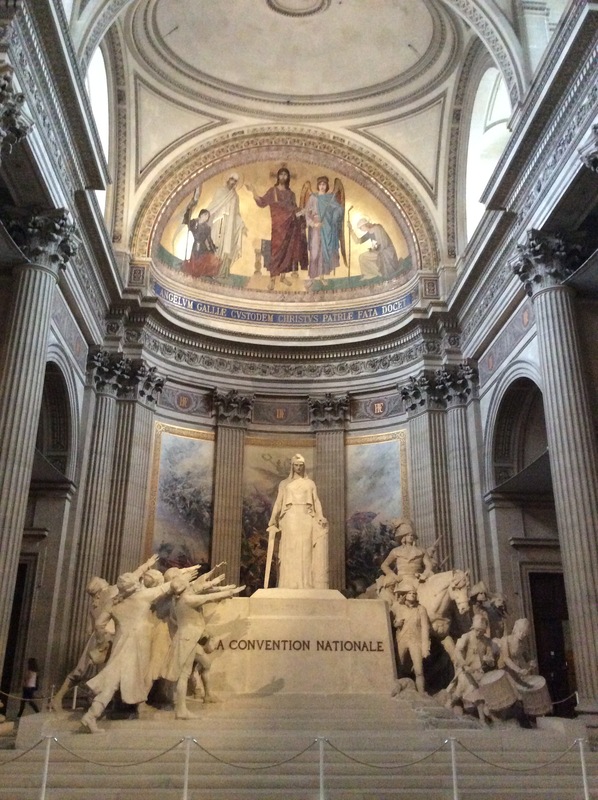 When he returned to Paris in September of 1792, he was elected to the French National Convention; no matter that he couldn’t really speak French, one who so eloquently speaks for human freedom and dignity speak to all. So though he might be properly honored by a sculptural portrait here, so far as I can find out, he has none among the niches. ‘French Revolution.’ Wikipedia, The Free Encyclopedia.